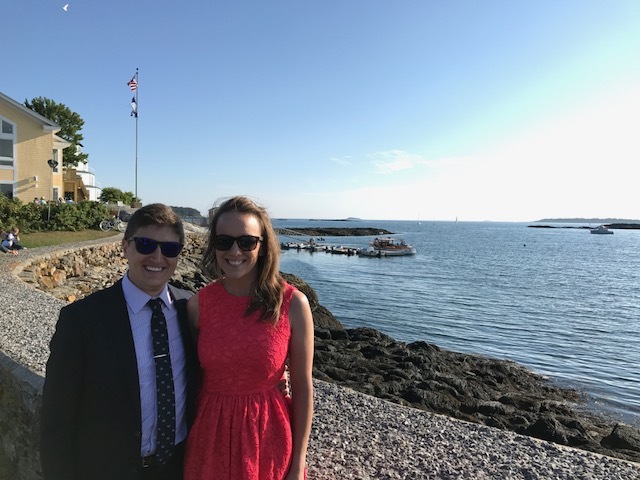 20th wedding of the season w/ Andrew & Jenn! 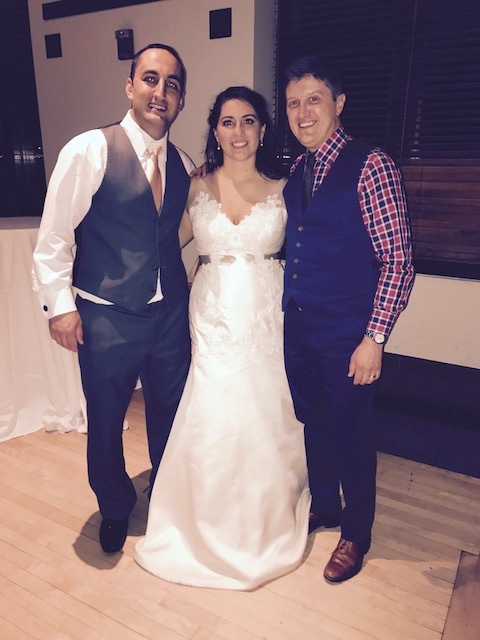 Say hello to Mr. and Mrs. Isidoro! 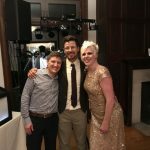 I was connected with this incredible couple after they were guests last year at Nick and Joanna’s wedding. 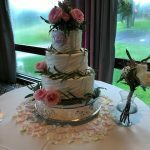 They got in touch shortly after that & after being familiar with my style and meeting over a coffee to just chat about their day – they secured the date and we were off and running with music planning. Another dream couple to work with in all areas and not just saying that to say it. 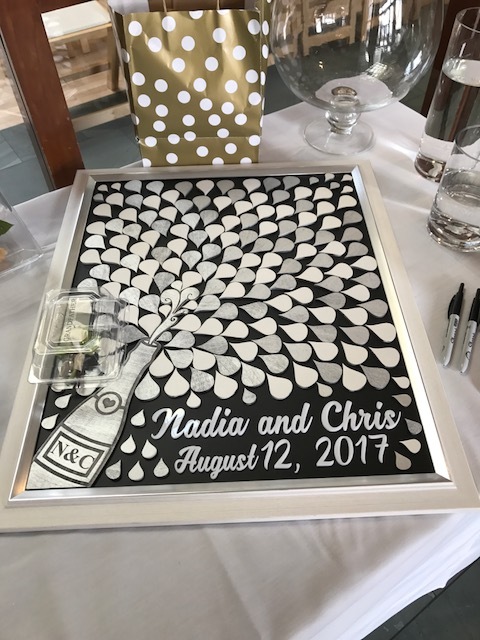 They were so prepared with every detail. I’m so SO lucky everyone I’ve worked with has been so down to earth – giving me some guidelines on what they want musically and not micromanaging the music – trusting I will incorporate their must and must not plays along with reading the crowds and keeping them moving. I had a couple of meetings with Andrew and Jenn and we went over every song choice for the earlier parts of the night to first and parent dances, etc. and their music choices were awesome. 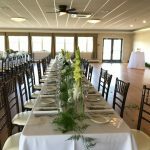 The ceremony itself was held off site – so I arrived to the venue a couple hours early to setup for cocktail hour, dinner, and dance party. 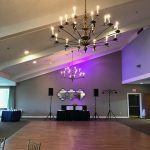 As a vendor – this was one of the easiest venues I’ve worked. Unload right in front up an elevator to the ballroom I was set up in. Cocktail hour was just one PA speaker just outside the ballroom in the bar area. 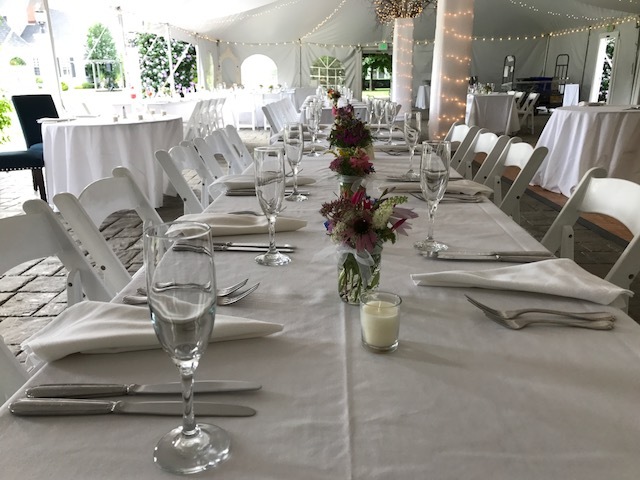 Once I had everything set up and ready to go – guests started coming in for the start of cocktail hour. 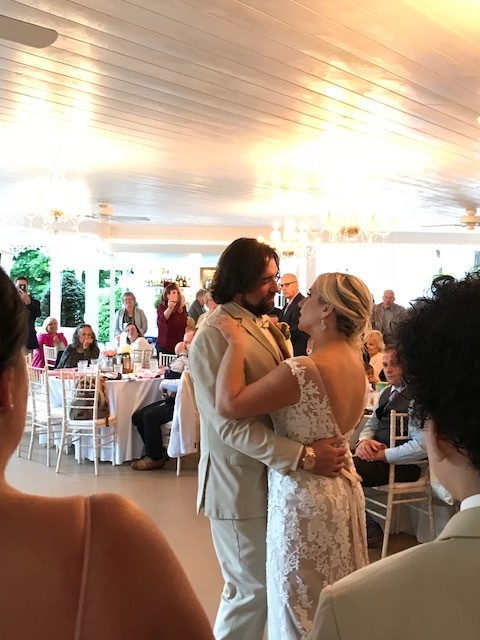 Jenn and Andrew wanted a chill mix of music for this part – Vitamin String Quartet covers to Rufus Wainwright and very mellow classic rock like Tom Petty’s ‘Wildflowers’. With cocktail hour coming to an end everyone made their way into the ballroom and took their seats for introductions and the first dance. 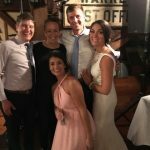 The bridal party was announced to Betty Who ‘I Love You Always Forever’ while Andrew and Jenn were announced to ‘Style’ by T Swift (starting at the 2:20 chorus to be exact). Going from that directly into first dance Iron and Wine ‘Such Great Heights’. From that we had a couple of toasts and into dinner with the music mirroring the cocktail playlist for the most part but adding in some indie rock as well from Mumford, Of Monsters & Men, etc. 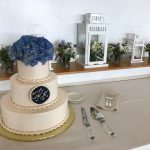 As dinner was winding down – Andrew and Jenn cut their wedding cake to ‘Cake By The Ocean’ from Dnce and went into their parent dances. 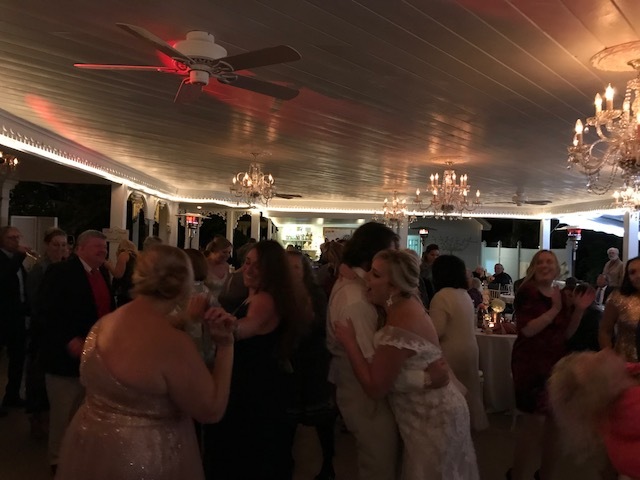 Andrew and his mother danced to ‘Into the Mystic’ from Van Morrison while Jenn and her father danced to REM’s ‘Nightswimming’ Both were great choices and we led right into an open dance floor and party. Thank-you Andrew and Jenn! 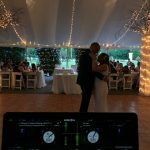 You guys rocked, your wedding rocked, please keep in touch and congrats!!! 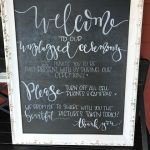 Before I get into a full recap here – let me send a huge thank-you out to Mandy of Hummingbird Bridal for connecting me yet again with another fantastic couple to work with. 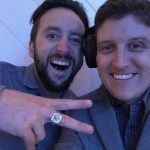 I was introduced to Rhys and Nick just about a year before their wedding date over beers, talking music details and their vision for the night. 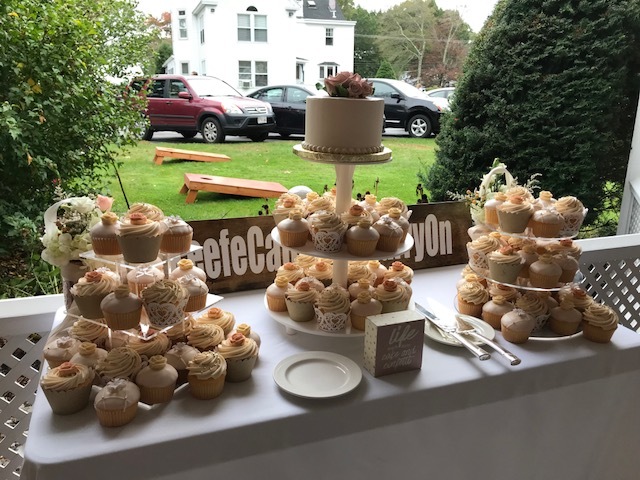 They were SO chill and down to earth to work with from start to finish which made the entire day incredible on their end and all the vendors as well. 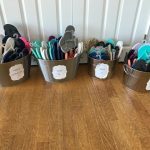 Without changing the routine of several years now – I stuck to what I do with each and every couple and was in touch with R & N a bunch leading up to the big day. Just emails here and there along with another face to face final check in meeting, going over setup of the venue or more in depth music details of what they wanted for cocktail hour versus dinner music, etc. and that way I am able to customize the setlists of music that really represented them as a couple while throwing in some crowd party pleasers during the night as well. 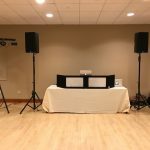 With everything ready to go and all of the music details worked out – I headed out to Belmont with a car full of equipment nice and early to get everything setup and sound checked. 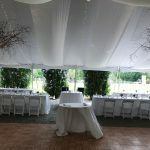 The venue was really cool with a unique layout being that part of the wedding (dancing/reception) would be held inside of the house area while the rest of it was all outside in a back garden area for ceremony, cocktail hour out on a back patio, and dinner was held under a tent outside as well. 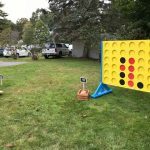 So – multiple set ups of gear so needed plenty of time to cover all the grounds. 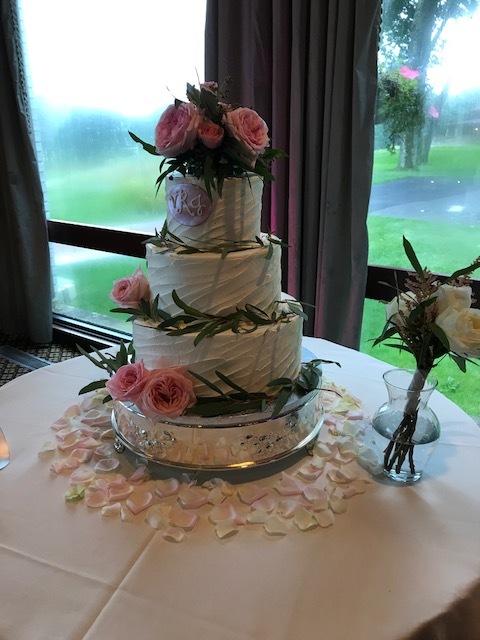 A huge thank-you and shout out to Kenny who works with Mandy at Hummingbird Bridal for giving me a hand running power all the way outside and shuffling gear around as well. 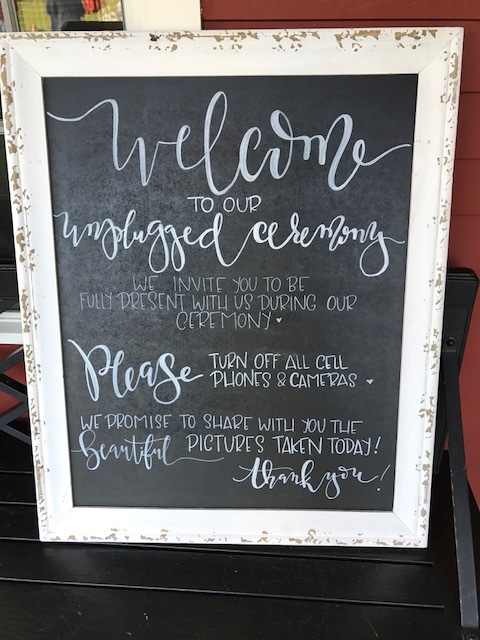 The ceremony was awesome! 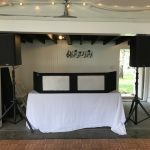 I had a speaker setup outside with some pre-ceremony chill music playing as guests arrived and took their seats. 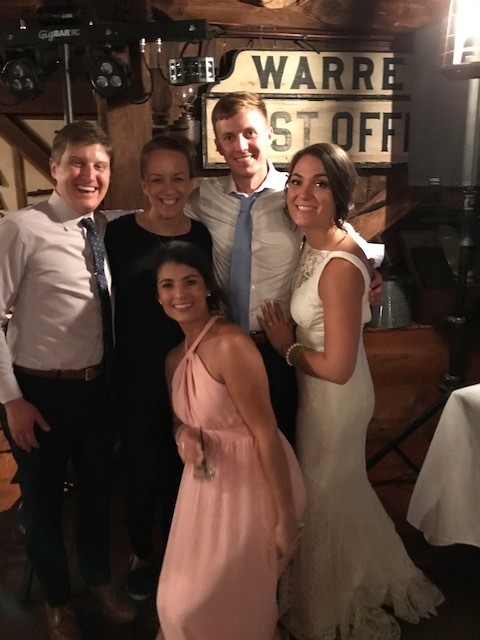 The processional song for the bridal party was Vance Joy ‘Fire & The Flood’ and Rhys followed them entering to this song as well. 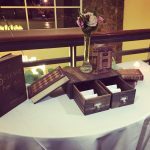 The officiant did an incredible job and I believe was a family friend so that made it even more personable for everyone involved. 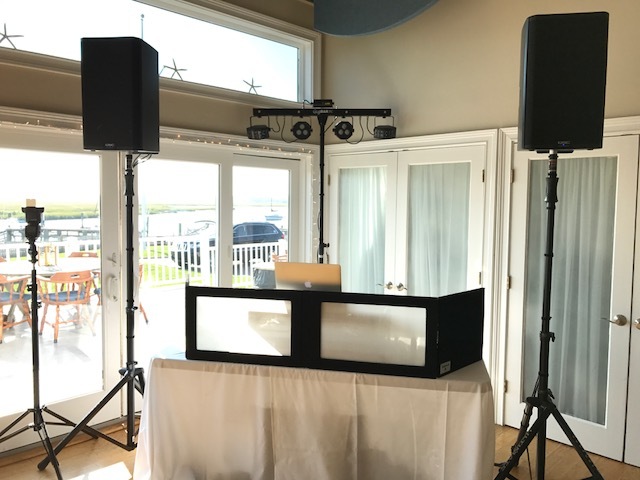 We also had setup a wireless mic as two other close family friends sang & played guitar for R & N – which I believe was an original song – it sounded incredible during sound check and even better live in the moment. As the ceremony concluded R & N walked off officially married to ‘Safe and Sound’ by Capital Cities. Cocktail hour was up next – Kenny and I shuffled the ceremony speakers back a bit to the patio courtyard area for this and had a playlist I put together of selection they chose: Billy Joel/Elton John, Of Monsters & Men, Lumineers, Jack Johnson, Tom Petty and much more. The guests all enjoyed it over some cocktails and catching up with one another. 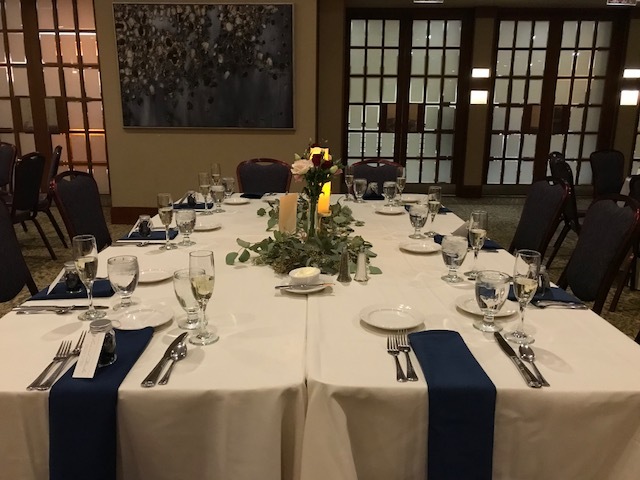 Dinner and speeches were up next and the music for this R & N wanted a very similar vibe but I mixed in a few more instrumental tracks as well to keep it mellow so people could still chat and not be overwhelmed with music. 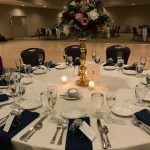 As dinner was winding down I made my way back inside to the reception/dancing area where my main setup was. 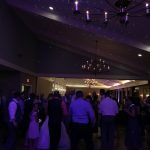 Once everyone trickled in – I introduced the newlyweds and they went directly into their first dance which led right into one of the best dance parties I’ve seen! 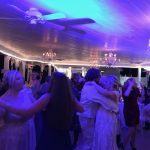 They chose ‘Shut Up & Dance’ by Walk The Moon as their first dance and everyone joined in halfway through. From there I was sticking to the must playlist of things like Jimmy Eat World, Pink, Pat Benetar, Passion Pit, Betty Who, while sprinkling in some old school funk and soul throughout the set along with newer Top 40. We also slowed it down at one point for a doubled up parent dance by Phil Collins – ‘You’ll Be in my Heart’. 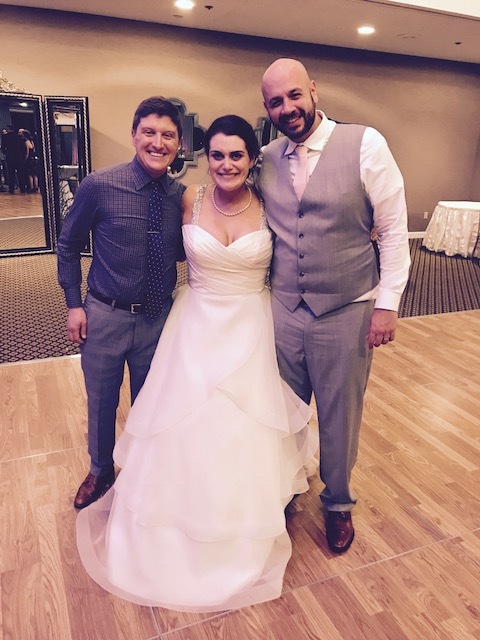 CONGRATS a million times over to these two – thanks so much for having me and choosing me to supply the tunes for the night! Awesome working with you both. 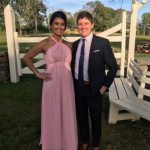 18th Wedding of the year is a 10/10 – Congrats Billy and Renee! 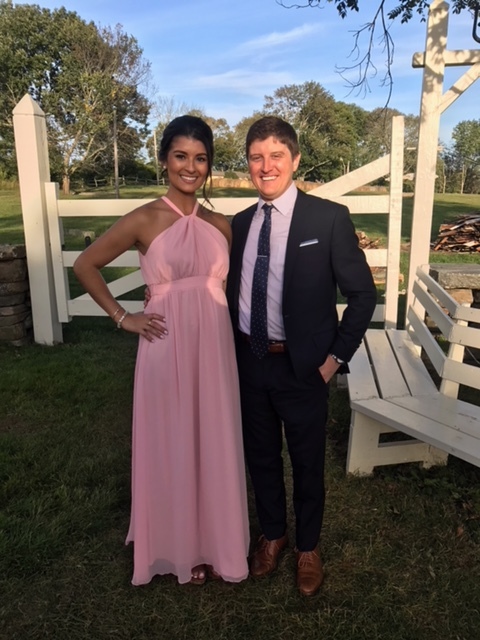 To start this off – a massive shout out and thank-you to my good friend Heather for connecting me with this awesome couple. 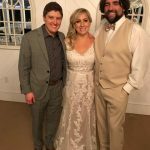 I had a blast getting to know and work with Billy and Renee from start to finish. 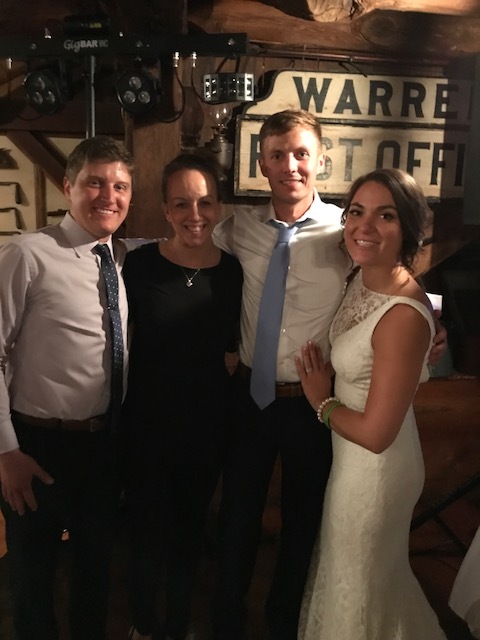 Super easy going, knew exactly the vibe they wanted, and together we all pulled it off and then some for a very memorable night. I met up with the two of them roughly a year or so before the date and I was fortunate enough to be booked soon after. Renee and I connected off the bat with our love for old school 80s/90s rock and hip hop. 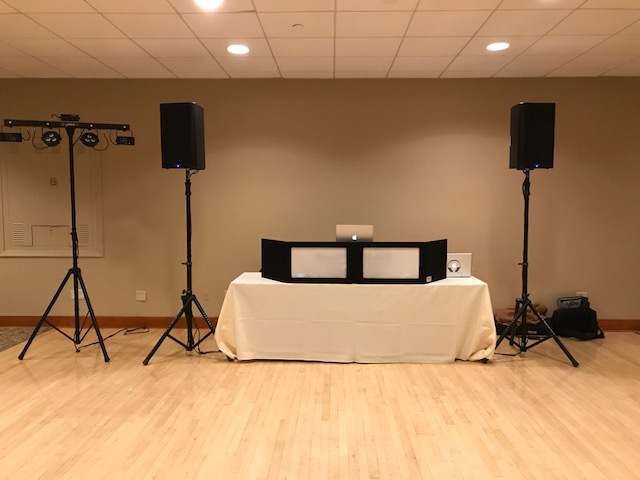 Billy has a touch more “country” side to him but it worked great with a list of music he provided me as well and we mixed it into the wedding flawlessly. 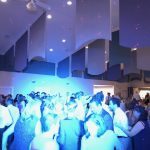 It was music that represented them as a couple and the crowd responded very positively during the night. I had a little bit of a drive from Boston so I set off as I always do nice and early to allow myself more than enough time for the multiple setups of the night. 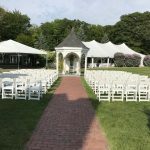 Ceremony was held onsite in a little lawn and gazebo area next to the Victoria Inn. 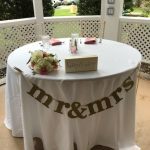 Due to some early evening rain – I was not able to setup any gear outside but luckily the venue owner allowed me to setup on a little porch right next to the ceremony site with a speaker and wireless mic. I had some pre-ceremony music shuffling as guests arrived of Vitamin String Quartet which R&B chose. 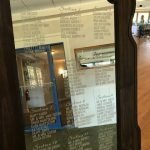 Once the ceremony began the entire bridal party entered to a track from a CD Renee had provided me ‘The Long Time Sun’ by Snatam Kaur. 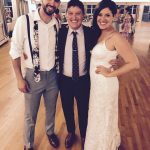 One of the groomsman then played Ukulele for Renee’s entrance song and it sounded incredible! 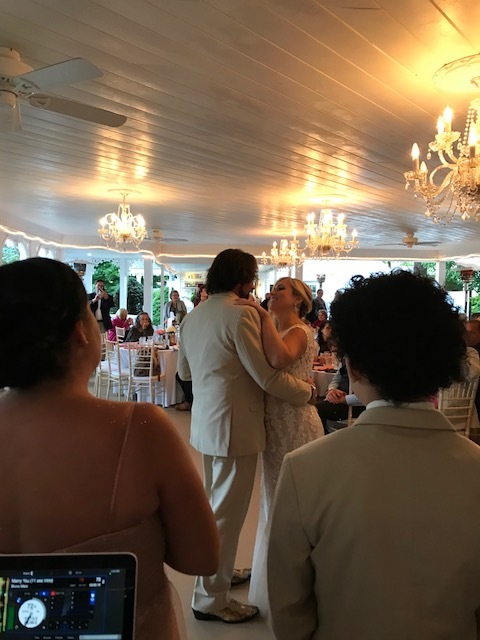 The wedding officiant did a great job with the entire ceremony and as it wrapped up Renee and Billy were officially married walking off to ‘You Are The Best Thing’ by Ray LaMontagne. Cocktail hour was up next with all the guests transitioning from the ceremony site over to a courtyard area for the remainder of the evening. 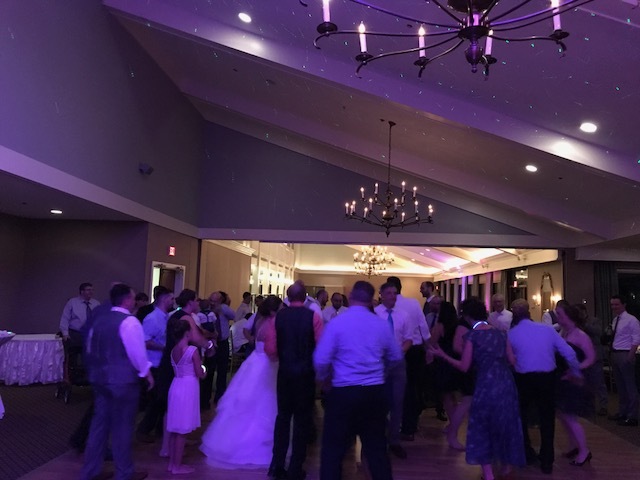 Renee and Billy wanted a specific mix for this part of the night with some chill 90s alt rock and country tunes which was a bit of a similar vibe to our dinner playlist as well. I don’t always get to play chill 90s alt rock so that was a treat for me. 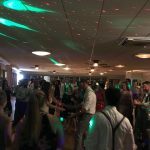 As cocktail hour concluded we went into wedding party introductions starting with ‘Uptown Funk’ for the wedding party themselves and then Renee and Billy “Team Renilly” to ‘Marry You’ also by Bruno Mars. 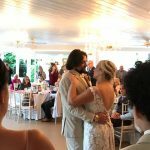 They went directly into the first dance – Ellie Goulding ‘How Long Will I Love You’. Awesome song choices for these parts of the night! Dinner was awesome – a taco/burrito bar which I inhaled. Cake cutting near the end of dinner was done to ‘Sugar’ by Maroon 5. 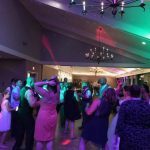 R&B then went into their parent dances at the end of dinner – Renee and her father dancing to Van Morrison ‘Someone Like You’ and Billy and his mother to ‘My Wish’ by Rascal Flatts. Up next was DANCE PARTY and a dance party it was! 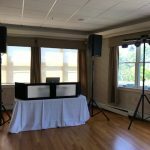 Kicked off with some classics from Mr. Stevie Wonder & Curtis Mayfield into some JT/Bruno etc and touched on just about every song on the “must play” list as well that R&B had provided me. 80s and 90s gems thrown into the set along with Jason Aldean/Zac Brown for Billy. 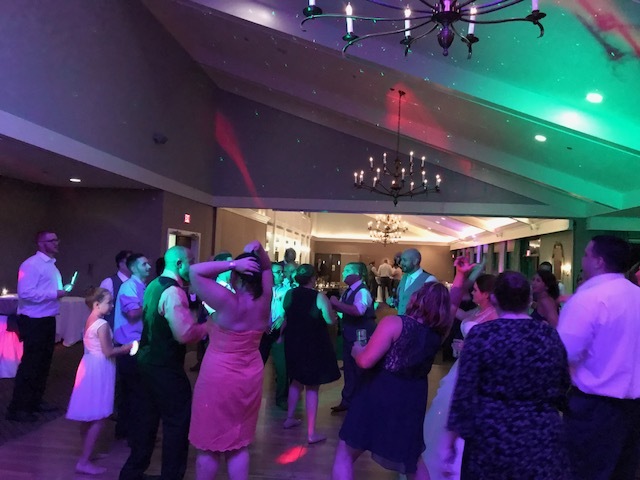 The crowd was a blast to play for – dancing their feet off from the second we started to the closing note ‘Closing Time’ by Semisonic. 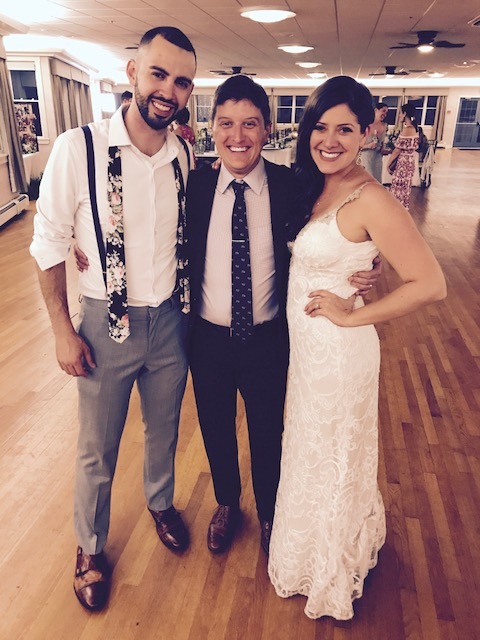 CONGRATS to Renee and Billy – thank-you tons for including me in your big day! 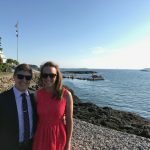 Everything about this wedding was incredible. Start to finish – one of the best I’ve ever been a part of with an incredible crowd. 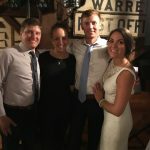 I was connected with Lainey and Jason earlier this year from a co-worker of mine (Shout Out to MONA!) who was nice enough to refer and pass along my info. Since they live in CT though and we were unable to meet up in person, we took advantage of the 2017 technology and facetimed just to chat details and vibe to make sure it would be a good fit. 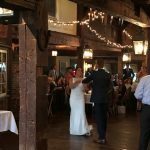 Before I knew it, I was requesting that Friday Sept 1st off from my office so I could rock L&J’s wedding at the Salem Cross Inn. 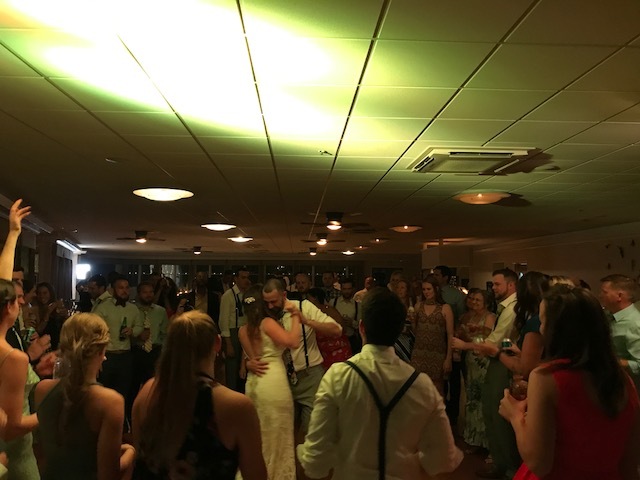 We had kept in touch via email and texts/calls over the months leading up to the wedding so I was always connected and on the same page timeline wise and music vibe to deliver them exactly what they wanted with a setlist that best represented them as a couple – while reading the crowd of course and throwing in some party pleasers as well. 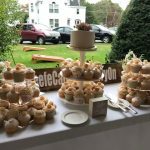 The venue was a bit of a drive from Boston so I set off that morning super early and had plenty of time once I arrived to setup outside in the back garden area for ceremony and cocktail hour along with everything inside for dinner and dancing. 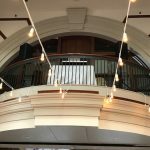 The venue was awesome – nice rusting New England feel and it sounded great as well which is always a bonus. 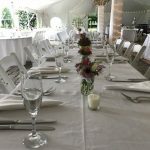 Never know what you’ll get weather wise when you book an event this huge so far in advance. 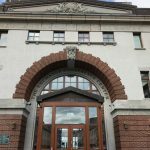 However – L&J lucked out and it was perfect. Sunny skies and not too hot either. 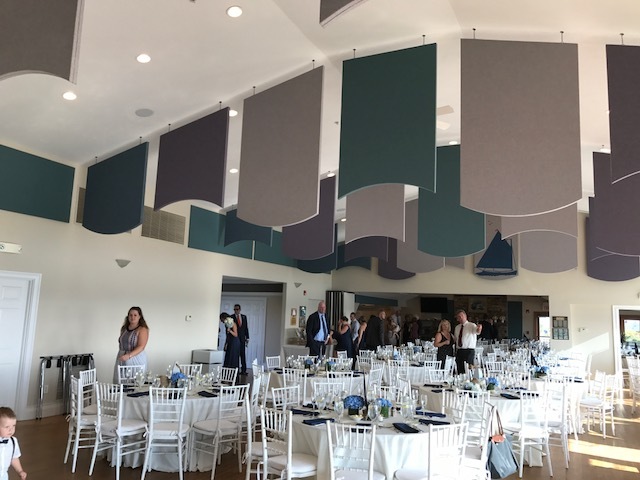 As guests started trickling in for the ceremony – I had one PA Speaker setup off to the side with a Mic for the officiant. Greeted them with some chill Vitamin String Quarter music as they all took their seats and was time to begin. 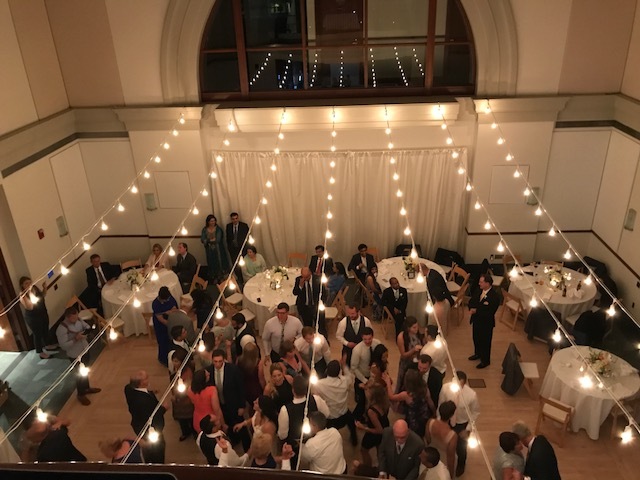 The wedding party processed to Ed Sheeran ‘Tenerife Sea’ while Lainey processed to ‘A Thousand Years’ by The Piano Guys (incredible cover of this song if you’ve never heard it). 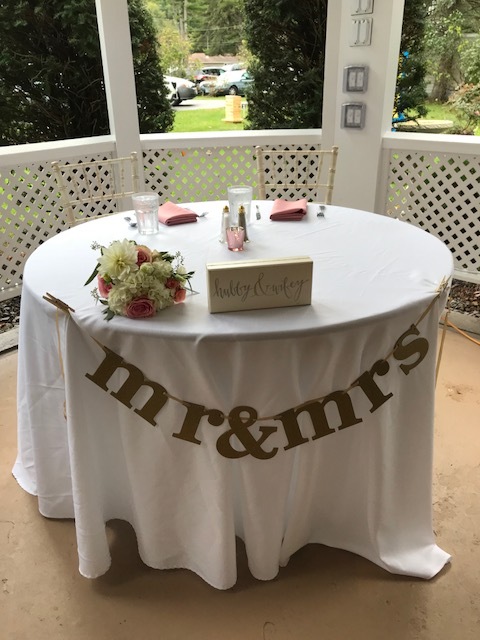 With the sun beaming down on them – they were officially married with the “I Do’s” and exchange of rings – and walked off to Whitney Houston’s ‘How Will I Know’. Everyone then made their way over in the same area to the cocktail hour where I had another speaker setup with a playlist we had gone over of specifics of music from The Fray, to Of Monsters and Men, Jack Johnson, and many others. 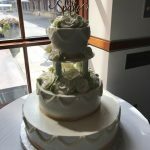 It paired well with the nice weather and gorgeous rustic landscape outside. 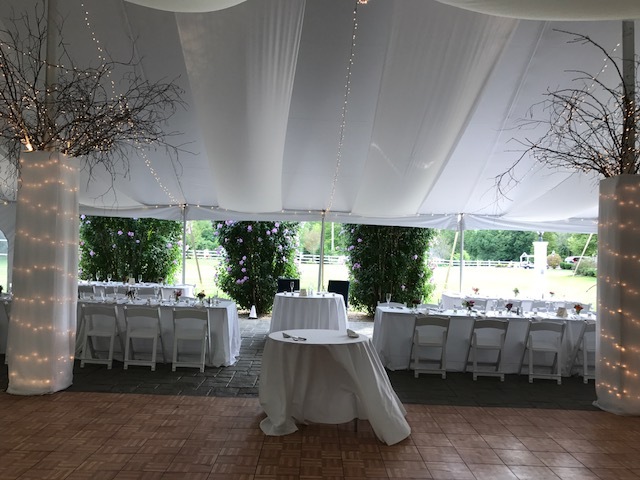 As everyone made their way inside the barn area for the reception – I had the wedding party lined up for introductions. Parents were all announced to Michael Buble ‘Thing Called Love’, Groomsman as a group were all announced to Macklemore ‘Thrift Shop’, The Bridesmaids were announced to ‘Girls Run The World’ Beyoncé and finally Mr. and Mrs. Jason Frey were introduced to ‘Crazy in Love’ by Beyoncé. 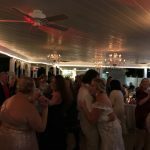 With the attention on them – they transitioned right into their first dance ‘Perfect’ by Ed Sheeran. 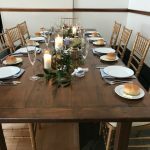 We got into a few speeches and toasts and dinner was underway with a similar vibe from cocktail hour – folk indie rock with some old school Sinatra esque tunes thrown in for good measure as well. 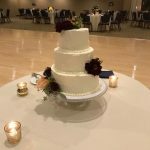 As dinner was winding down L&J went into cake cutting with the song they chose ‘Sugar Sugar’ from the Archies. Lainey was then up with her father for a dance to ‘I Loved Her First’ by Heartland. 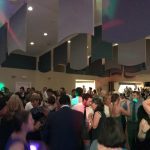 Dance floor was then officially open to all guests – and all guests took over and rocked out. 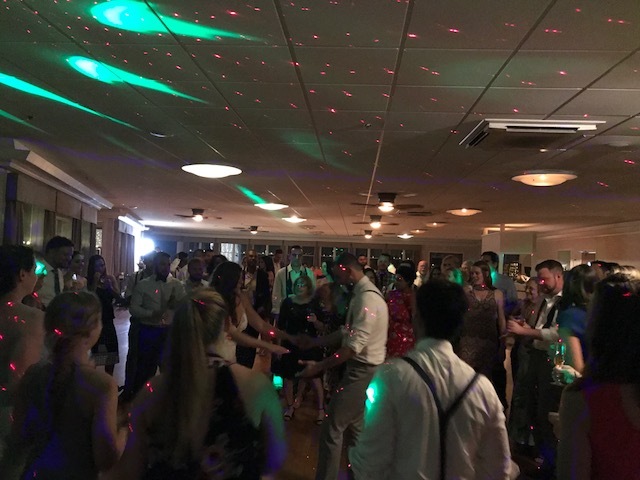 With the lights dimmed down a bit and my lighting rig thrown on – I kicked off with some classics from Contours, Jackson 5 and into Bruno, JT, and all over the music map of 80s/90s/early 2000s and other Top 40. 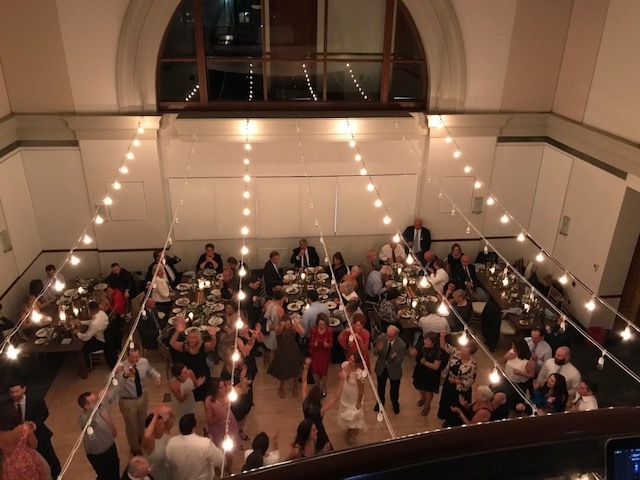 The energy was crazy and as I said earlier – made for one of the best weddings I’ve ever done. I remember waking up the next day wishing we could do it all over again. 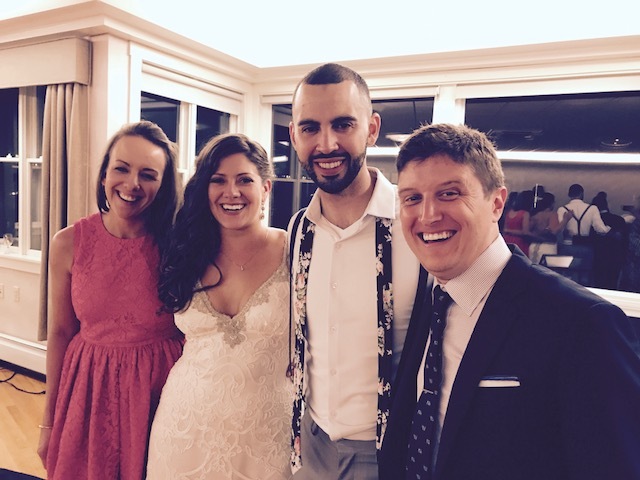 Congrats to Lainey and Jason – and thank you for allowing me to be a part of this party. I still think we should just do it all again sometime soon! CHEERS!!! 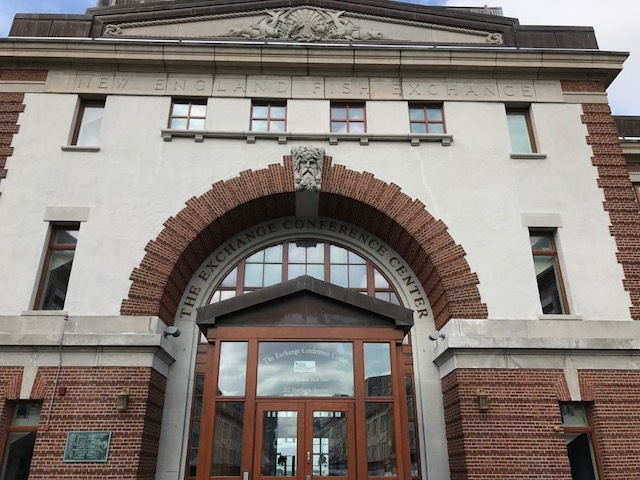 I was thrilled to be back just two weeks later at the Exchange Conference Center in Boston. 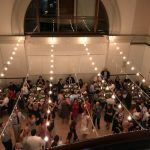 I never knew this venue existed and it’s a total hidden gem – if you’re thinking of a city based wedding I highly suggest taking a look at this one. 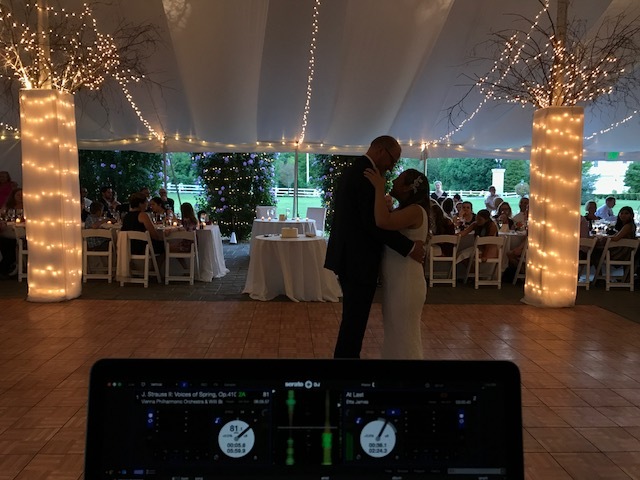 A massive shout out to Mandy Connor of Hummingbird Bridal once again for connecting me with Dave & Alyssa – another great couple I had the pleasure of working with and bringing all of their musical ideas & suggestions to life. 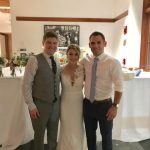 The three of us sat down for an initial coffee consultation meeting way back in the early months of 2017 just to chat and go over their vision for the night to make sure I would be a good fit / or not good fit for the big day. 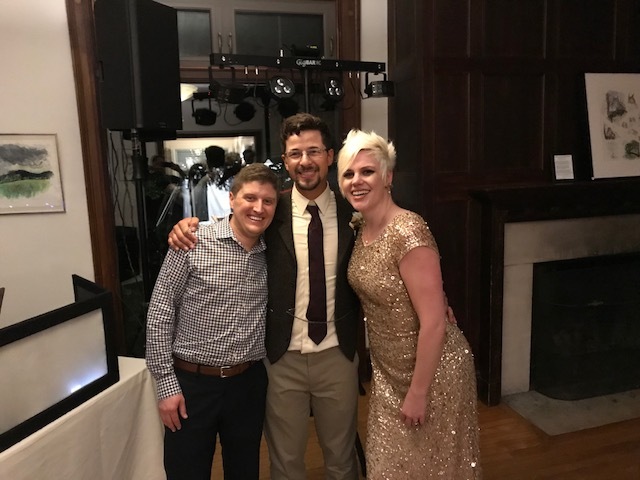 I got along great with D&A right off the bat – they were funny, very chill, and just wanted to throw the most amazing party of their lives & I think that was achieved and then some. Alyssa even stopped by one of my Friday night 90s Night gigs early on to get a feel for my style in person – and soon after that I was booked for August 26th. 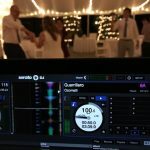 Over the course of the months leading up – we kept in touch on email just to make sure everything was going smoothly for them and what music they were looking to narrow down along with the very important do not play list. We had one final check in meeting over a few drinks to run down the timeline of the day, music choices for the early parts of the night and every other little fun detail to iron out. 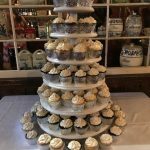 Having Mandy coordinate and plan as well was a massive help – she is beyond detailed and thorough to make sure each vendor is on the same page to deliver the best night ever for the couple. 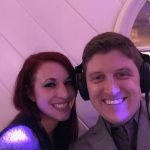 A couple of weeks before the date, Alyssa emailed me over the questionnaire form I also have each couple fill out – and I got all of the playlists organized and ready to go. 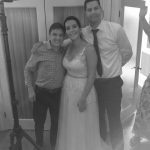 As I said – having just done this venue earlier in the month for Nadia and Chris’s wedding – It was an easy setup for me and knew where to go with no hesitation. 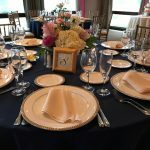 Truly one of the easiest venues as a vendor I’ve ever worked before. 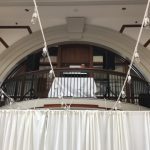 I loaded in early enough to allow myself to set up on the second floor overhang balcony area again while Mandy, Kenny, and Brenna were flying around with all of the final details as well. It looked INCREDIBLE when it was actual show time. 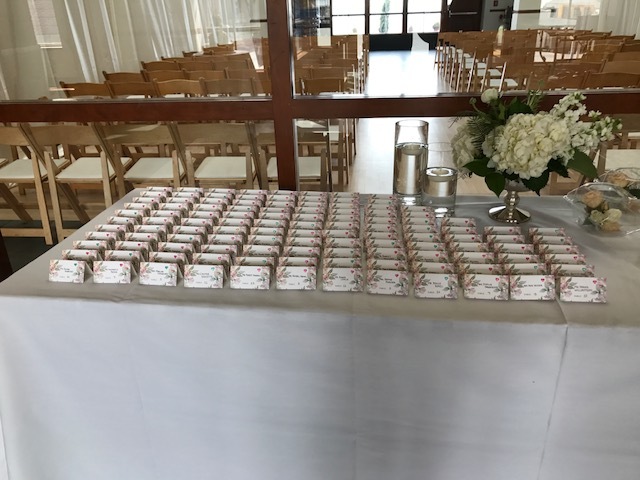 A&D were holding the ceremony off site in the seaport and had the guests and themselves all shuttled over in trolleys when that concluded. 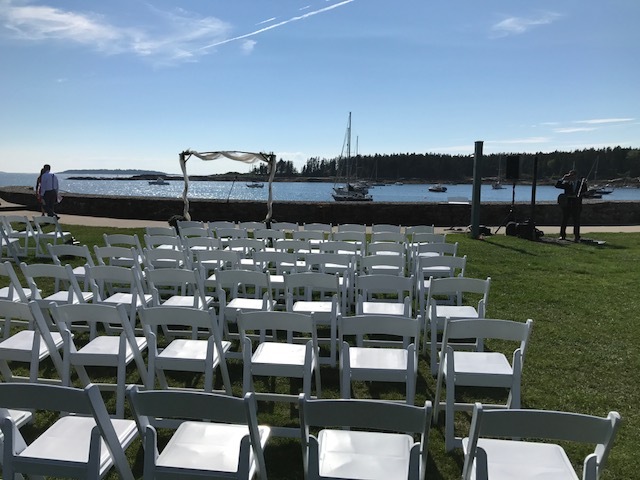 Out in the back of the venue on the water (and another amazing/sunny day for weather thankfully!) 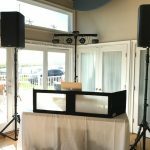 I had a speaker set up with cocktail hour music playing as the guests all arrived to grab drinks and relax. The cocktail tunes they chose were a mix of old school big band stuff from Sinatra, to Dean Martin with a little bit of country as well. It fit the mood great being outside on the water of Boston. 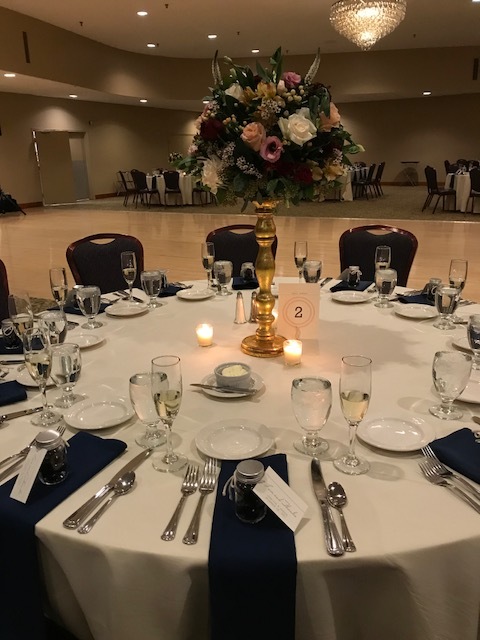 Once the guests all came in and took their seats (OH and btw – MOST AMAZING CENTERPIECES EVER – THEY HAD A FREAKING MEAT AND CHEESE BOARD CENTERPIECE!!!) Mandy and her crew lined up the wedding party and couple for introductions. 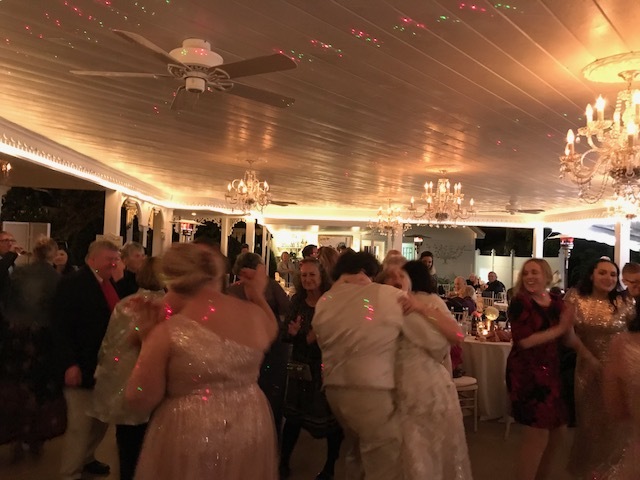 We first introduced the group of bridesmaids to “You Look Good” by Lady Antebellum and the groomsman were announced to “Bad Boys” by Inner Circle. Dave is a cop so this was a perfect fit for that. 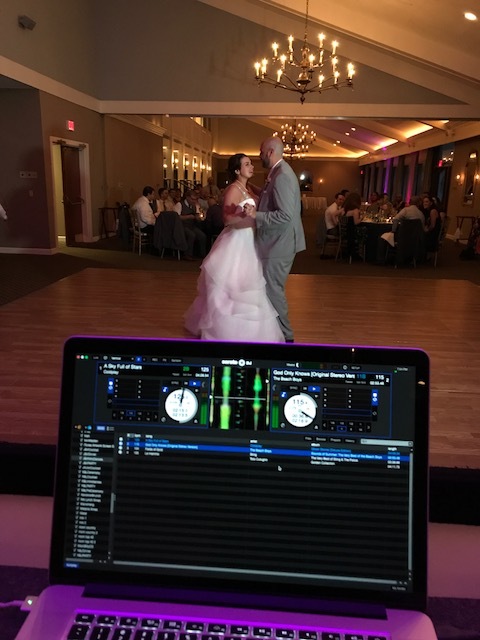 Up next was Mr. and Mrs. David McMenamy to a first time ever intro song “Ruff Ryders Anthem” by the one and only DMX. People LOVED it (myself included). 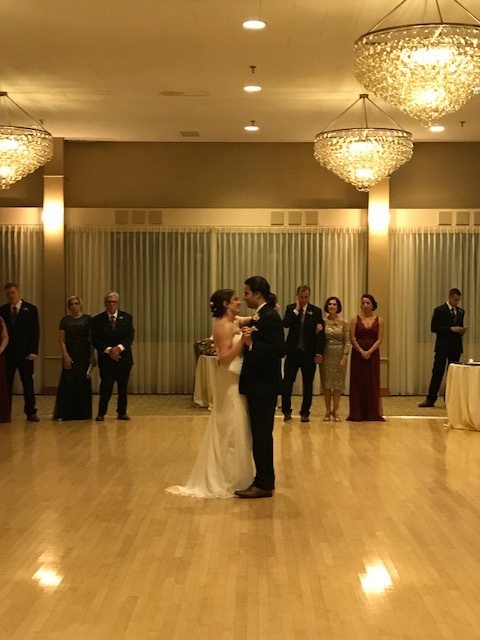 As they entered the room – we had them go directly into their first dance which was awesome and very unique. 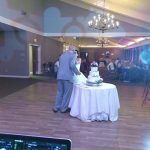 Alyssa’s uncle actually sang to an instrumental back track I played to “Can’t Help Falling in Love” and he crushed it. Standing ovation at the end of that one needless to say. 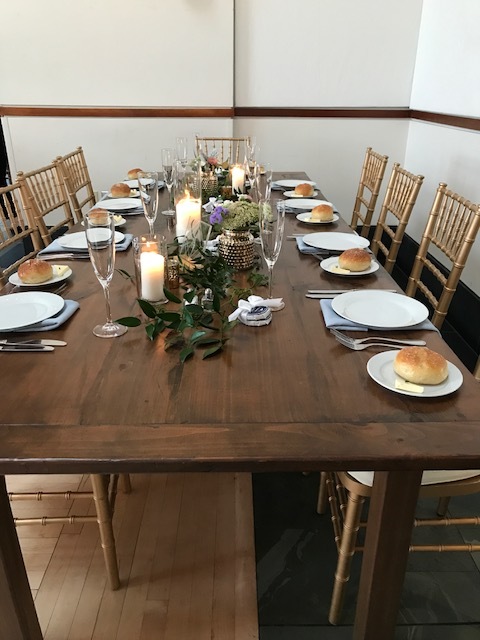 We kept things rolling with speeches and toasts into dinner music which they wanted a similar vibe to their cocktail hour playlist – just easy going mellow music so people could chat and relax. 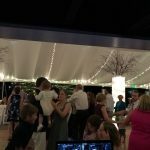 With dinner winding down, Mandy went over to let A&D we would kick off the dance party with the parent dances and transition into open dance floor from that. 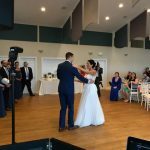 Up first was Dave with his mother dancing to Paul Anka’s “Times of your Life” and then Alyssa dancing with her Grandfather to “Summer Wind” by Sinatra. 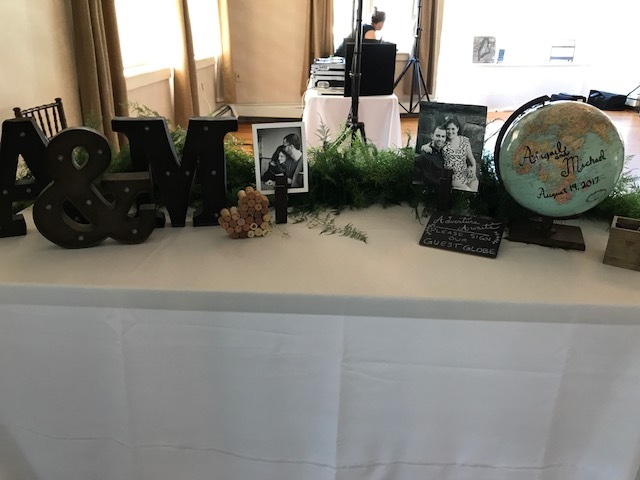 Halfway through the dance I announced for her Grandmother to come join in and it was such an awesome moment to see the two of her grandparents sharing a dance. From there we kicked things off with some old classic funk/soul into the 80s and 90s and top 40. The crowd was PHENOMENAL to play for. 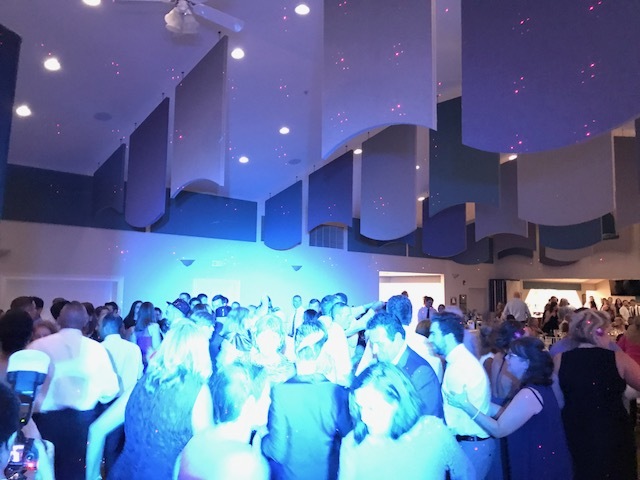 They were on their feet from start to finish – open minded to everything I was playing while following their must playlist and keeping true to the do not play list as well. Before I knew it we were doing the final shout out of the night and last song before they all took off for the after party at a bar in the area. 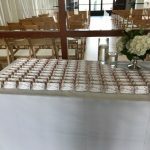 Alyssa and Dave – you guys know how to wedding. 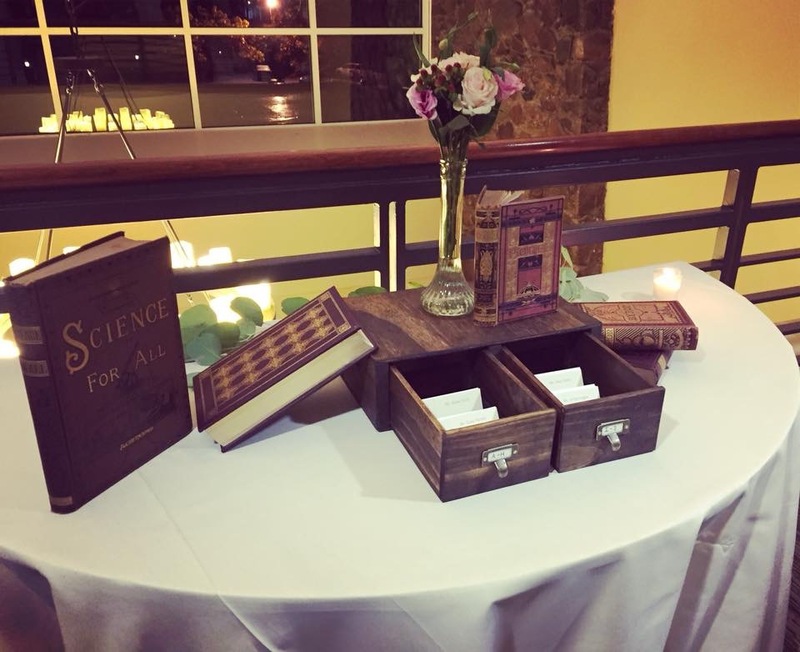 Your crowd knows how to wedding. 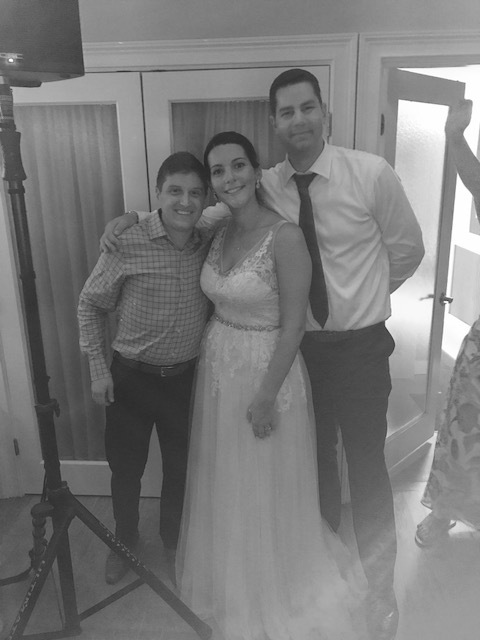 Thank-you TONS for having me be a part of this day and sharing it with you both. Hopefully I will see Alyssa at a 90s Night sometime soon – or if I need to get out of a ticket I will possibly give Dave a call! 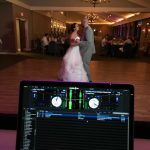 Another double header weekend – partying with Abby and Mike for the 14th wedding of 2017 season! 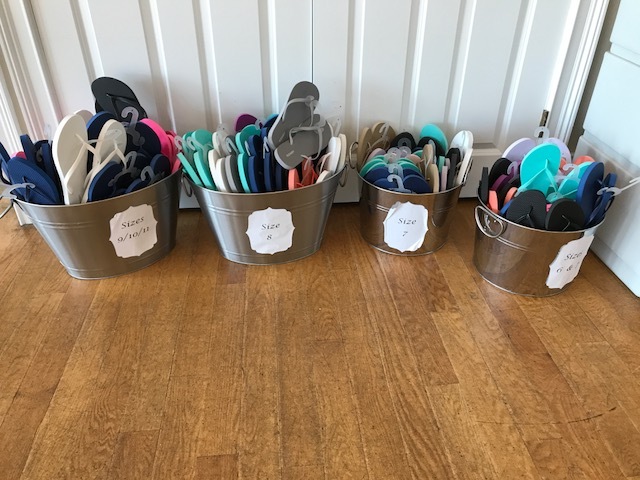 Where to begin?! 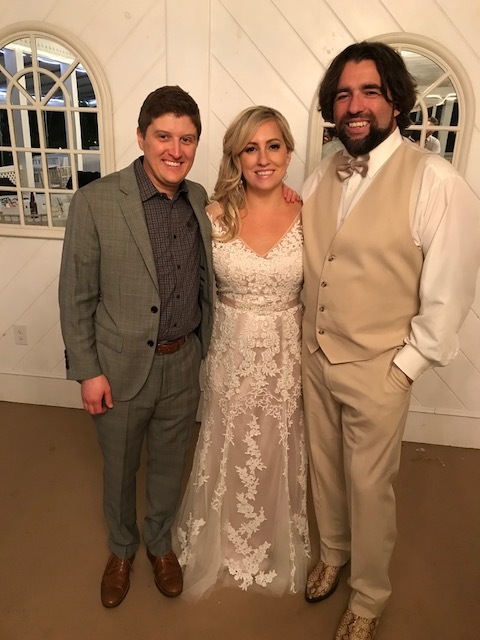 I’ve had the pleasure of knowing Abby for the better part of a decade now (and it was awesome to see some old friends in the crowd, shout out to Jen, Jayme, and Dennis). 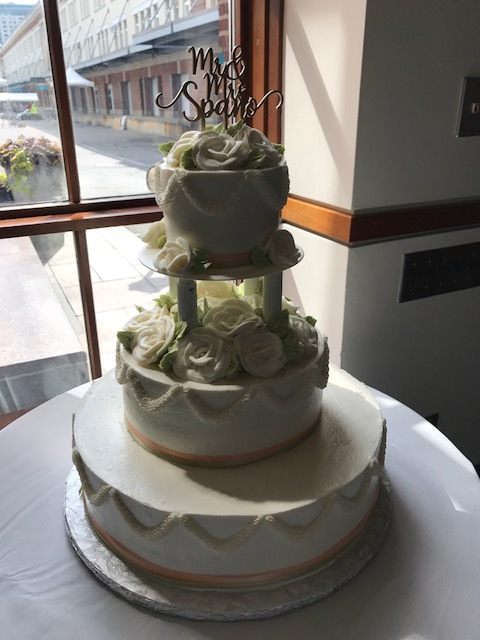 Abby who is also a photographer shot my surprise engagement and party back in 2015 at the Coolidge Corner Theatre – her work is amazing so please go check her out! This entire experience was just incredible. 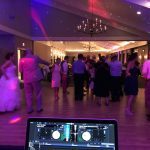 After wrapping up my Friday night wedding in Bolton, Mass. 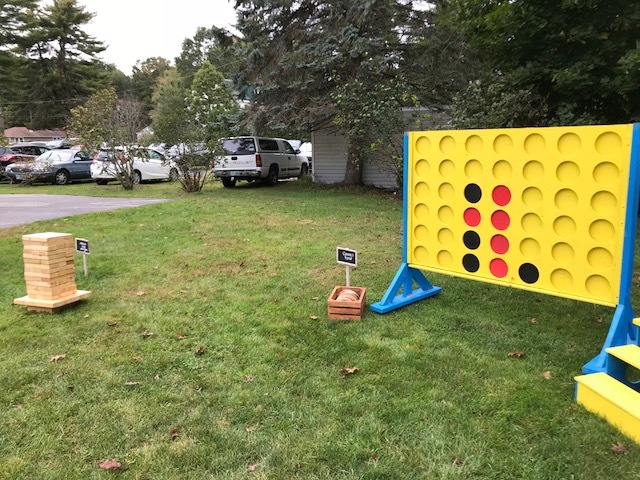 my assistant/roadie superwoman wife and I made the 3 hour trek right up to the venue in Maine so we were at least on site and not dealing with a drive like that on Saturday morning. The venue was freaking awesome. It was like a little village with cabins all over and a huge vacation spot for families and couples just wanting to get out if the city insanity and chill for a few days. I worked very closely with M & A to make sure I got everything right musically and vibe wise. 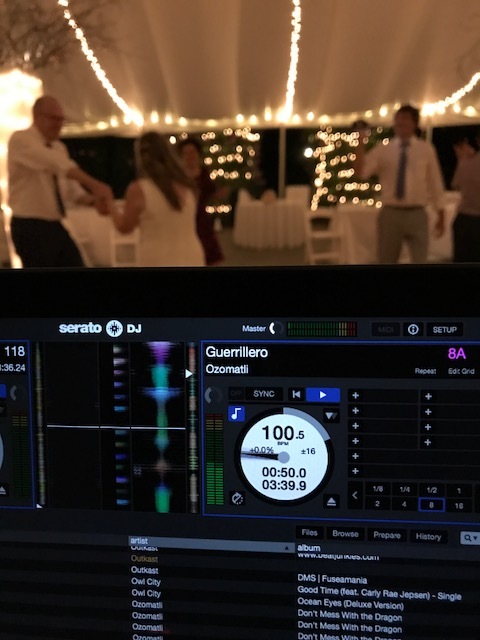 Mike wanted to incorporate a lot of Spanish / Salsa / Reggaeton dance vibes throughout the night while providing me a list of songs to download ahead of time. 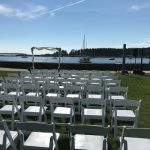 Once I was set up in the main reception area of the venue – we also headed down by the water for a smaller set up for the ceremony. 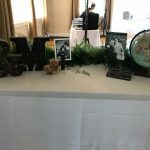 In addition – they also had a live guitarist & singer Peter Miles – who was INCREDIBLE playing some chill pre-ceremony tunes along with the ceremony music. 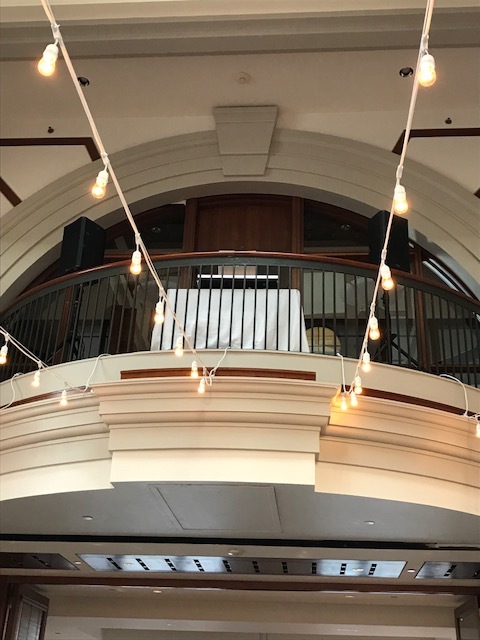 I had a speaker in place with a mic for the officiant and also a keyboard plugged in for Abby’s sister who sang and played a song which was the best thing EVER. Like, seriously, ever. 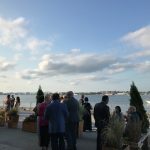 As the ceremony wrapped up we all enjoyed cocktail hour to Peter Miles still playing covers and the weather was amazing that day – felt so good with the breeze coming off the water as well. 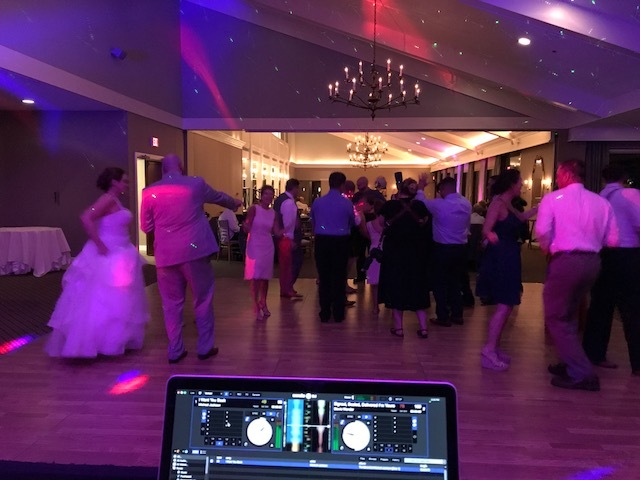 I loved it because not only was I DJ’ing but I was a guest at this wedding as well – so I was able to actually hang out and enjoy some drinks/apps before we all made our way back into the reception area. 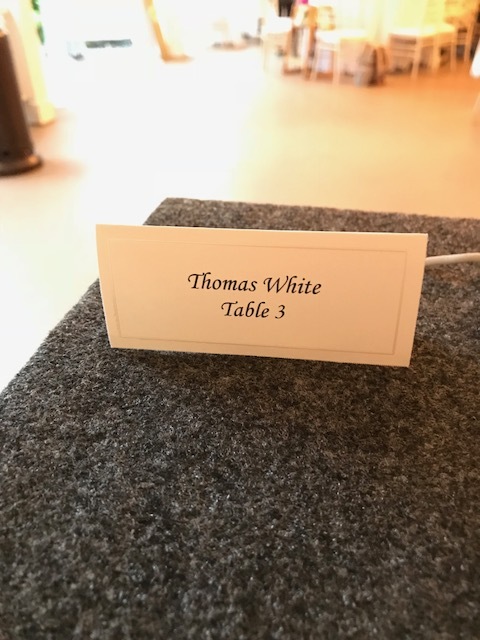 I headed up before the rush of the crowd to throw on some chill music as they all found their seats and tables and we went right into the introductions. 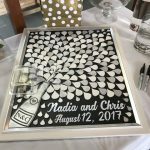 Up first were the group of groomsman with the ring security – being announced to Wisin ‘Vacaciones’ and the bridesmaids were all announced to ‘Raise Your Glass’ by Pink. 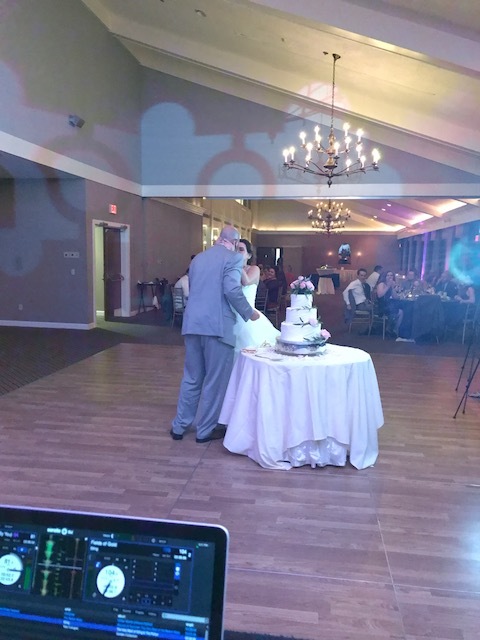 Up next was Mr. and Mrs. Murphy being introduced to ‘Uptown Funk’ and going directly into their first dance. 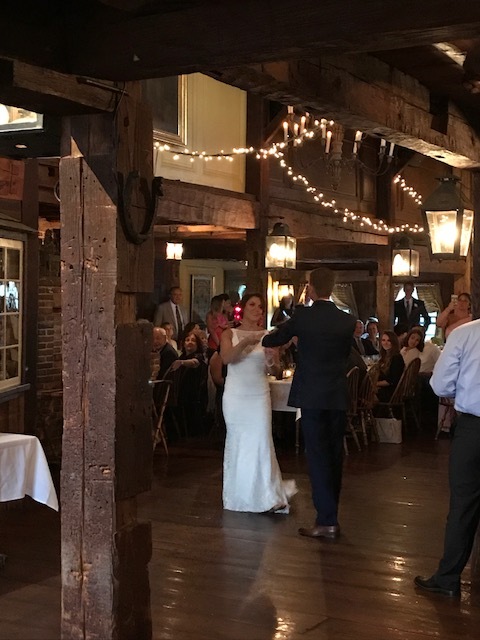 This first dance pretty much just owned all other first dances ever. They started out with a minute-ish of ‘I Choose You’ by Sara Bareilles and going into a salsa dance song ‘El Gran Combo’ by Brujeria. The place went nuts as this kicked in and they busted out some incredible moves – SO fun to watch this come to life after months of knowing about it and hearing about it. 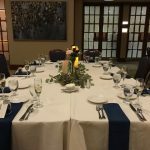 From this I was actually able to take a seat and enjoy dinner with everyone which I never get to do! Felt great and I had on a chill dinner playlist going with some specifics Mike wanted along with some chill reggae stuff from Bob Marley/Jack Johnson, Lumineers, Tom Petty, and lots others. 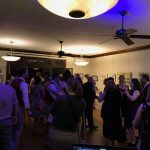 The vibe was great in the room and peopled seemed to be enjoying the music so far. 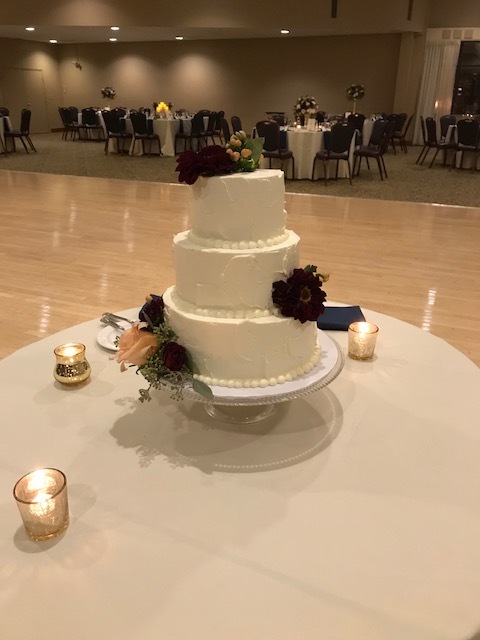 As dinner was wrapping up we got the speeches and toasts going – some hilarious and amazing speeches from parents and friends let us into the cake cutting with ‘Sugar’ by Maroon 5. 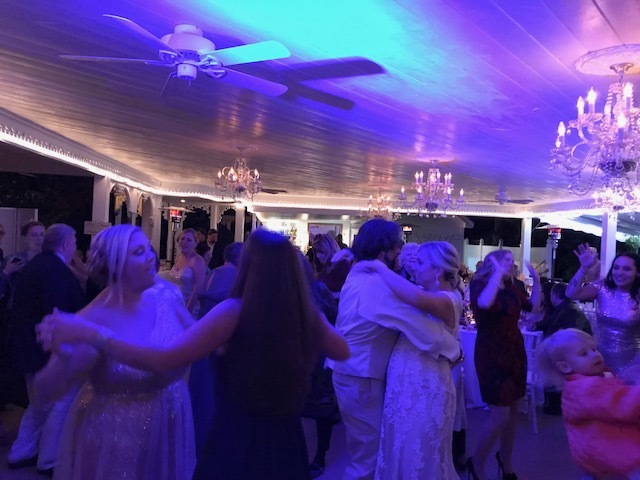 Opening up the dance floor with back to back parent dances, Abby and her father to The Beatles ‘In My Life’ and Mike and his mother to ‘You’ll Be In My Heart’ by Phil Collins. 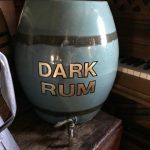 From that – I take no responsibility for the madness that ensued for the next two hours. This crowd was out of control in the best way possible. 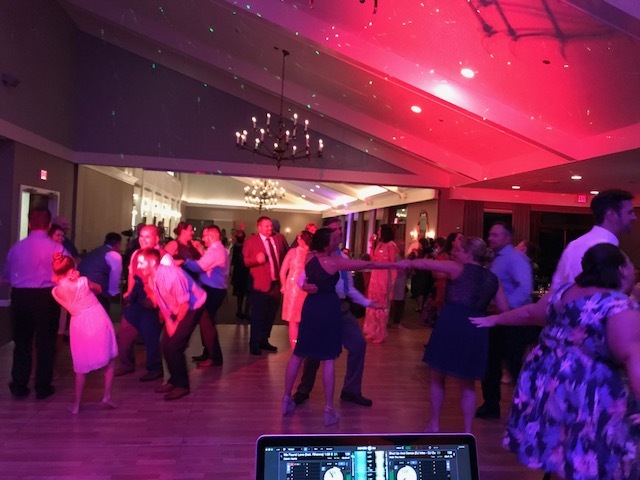 Spanish, salsa tunes (yes, yes Despacito was played) mixed up with all top 40 radio hits and digging into the amazing decades of the 80s and 90s. The lights were dimmed down and I had my lighting rig switched on and it was pure amazingness. 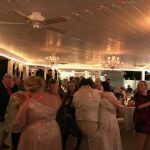 Hands down one of the most fun groups of people I’ve played to in my wedding career! The night came to an end with two songs Mike and Abby wanted to send their crowd off with: Carlos Vives ‘Volvi a Nacer’ and the grand finale song of the night was ‘Under The Sea’ from Little Mermaid haha – I can surely say I’ve never ended a wedding this way but it was amazing with all 120 plus guests singing every word at the top of their lungs. 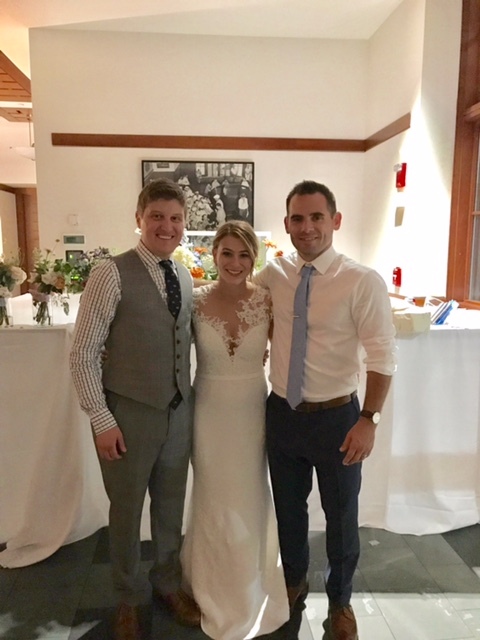 CONGRATS Mr. and Mrs. Murphy – thank you guys SO SO SO much for having me as a guest and DJ for the big day. CHEERS!!! 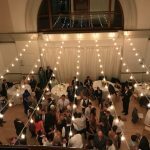 Photo: Hannah Gunnell of Ramblefree Photo Co.
Pay attention and take notes people – THIS is how you wedding. You first off start out by being incredible to work with and really knowing exactly what you want/don’t want for your vibe and music. 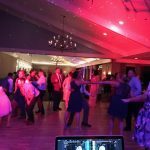 You then share a mutual love for the 80s and 90s with your DJ along with old school hip-hop, old school funk, soul, and Motown. Along with sharing a mutual love for good drinks and beers. Along with a mutual love for Larry Bird and the classic Boston Celtics. Add all of that up? 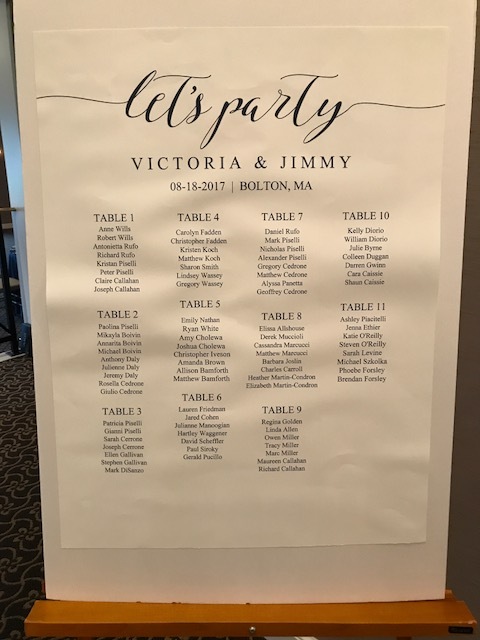 You get Jimmy and Victoria’s incredible wedding. 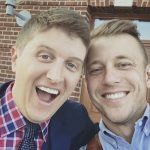 I loved getting to know these two over the course of the year leading up to the big day. So nice and fun, just awesome genuine good people. They had seen me at 90s Night in the past and connected with me from that and I’m so glad they did. 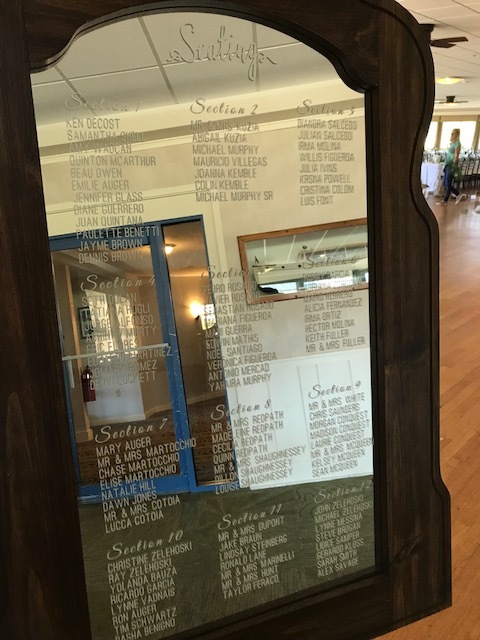 The venue – which I’d never played before was awesome and home to one of the most famous golf courses in the New England area. 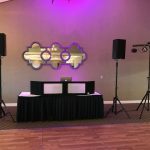 The staff was super friendly and I felt very comfortable from start to finish while setting up and sound checking. 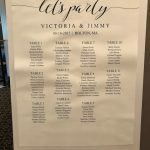 While Jimmy and Victoria held their ceremony off-site – my wife (best assistant ever! 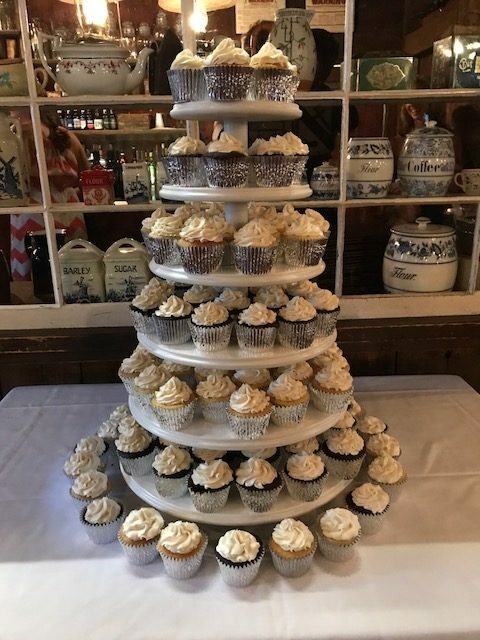 Thank-you again for working on your birthday) – we got everything ready to go nice and early and I greeted the guests coming in for cocktail hour to start with requests from the couple of music from: the Temptations to Otis Redding to Jackson 5 to Curtis Mayfield. 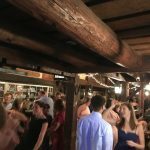 It was a great vibe and how could you not tap your foot along to that music while enjoying a cocktail? 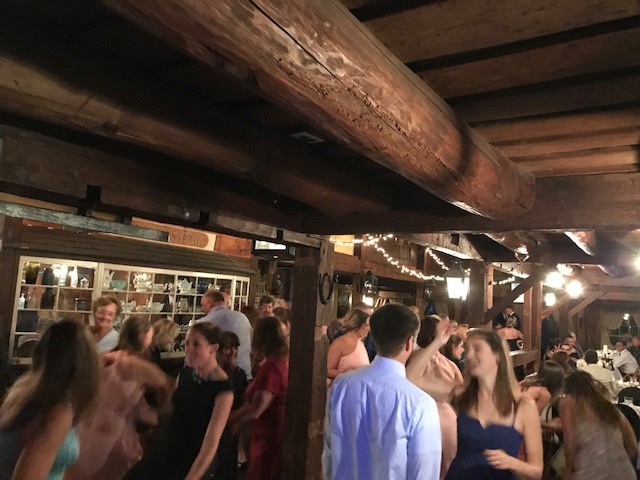 With the cocktail hour winding down – I then introduced both sets of parents to ‘Start Me Up’ from the Stones and Mr. and Mrs. Rufo to ‘Sky Full of Stars’ by Coldplay. 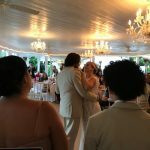 Their first official dance as husband and wife was next – The Beach Boys ‘God Only Knows’. Such a good song! Dinner kicked off with a few toasts and speeches and the dinner playlist as handpicked from J&V was a little bit of the cocktail vibe but also getting into some chill classic rock as well. I could feel the energy in the room and it was awesome – I was excited to get this crowd up and moving for the remainder of the evening. 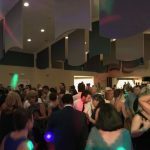 The parent dances led into open dance floor – Jimmy and his mother dancing to an Italian song ‘Le Mamme’ by Toto Cutugno and Victoria and her father to ‘Fields of Gold’ by Sting. The playlist for dance party was everything you could imagine. 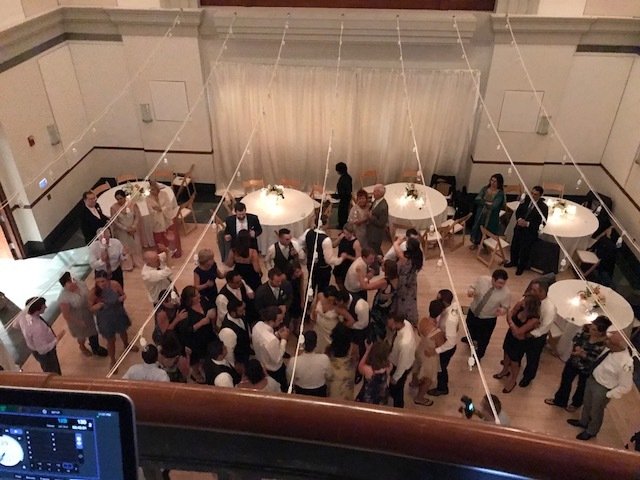 I kicked it all off with some Jackson 5, Stevie Wonder, Aretha, etc. 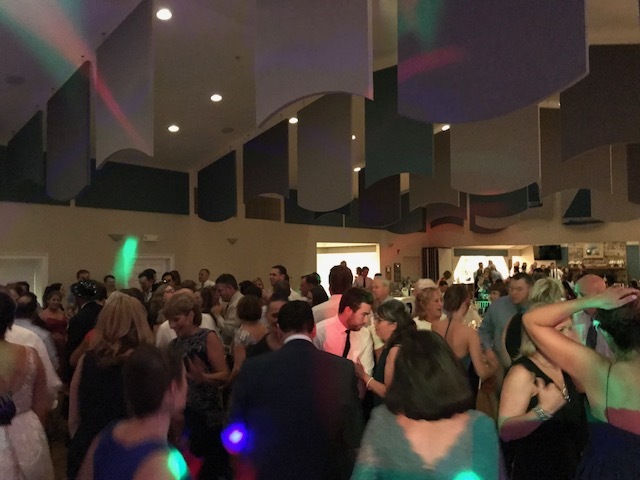 to get all ages and generations up and going – carrying into MJ, Prince, Billy Idol, along with all the 80s and 90s, top 40 gems on their do playlist. Later in the night we got into some rock and roll and touched on Jimmy’s fave band GNR with a massive sing-along to ‘Sweet Child of Mine’ and back into the funk soul, and repeat. Everyone was amazing in the crowd and danced to whatever was being played. We capped the night off with an MJ/GNR medley. I think a few people lost their voices at this one! 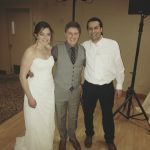 THANK-YOU Jimmy and Victoria for being so awesome and choosing me to rock the house. Celtics games, 90s Nights, and beers are a must up at some point soon. 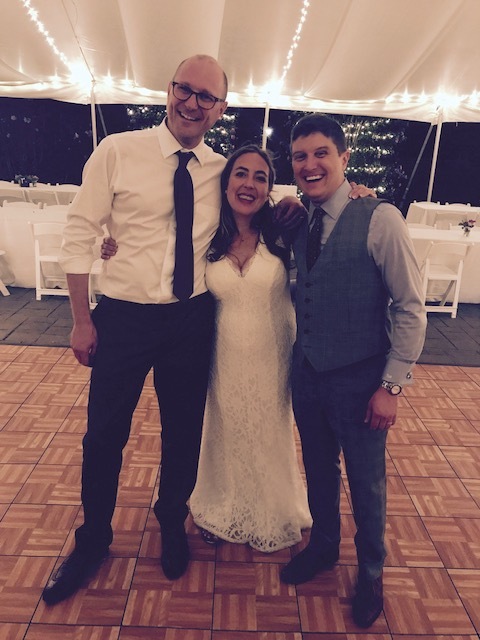 Cheers and congrats to you both!!! Chris and Nadia were incredible to work with. I was lucky enough to be referred by our now mutual photographer, Mikhail about a year ago for this one. After a consultation meeting and checking me out at 6B Lounge on a Friday for 90s Night – they booked and confirmed me for August 12, 2017 & the rest is history. 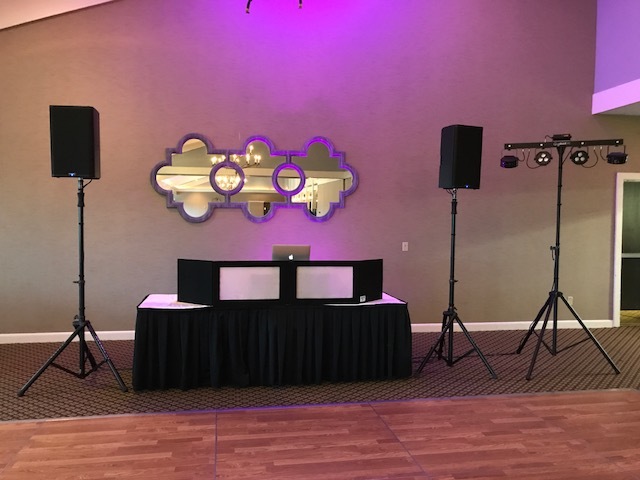 They were SO easy going and fun to work with and get to know over the entire process of planning all the details, vibe, and music for the night. 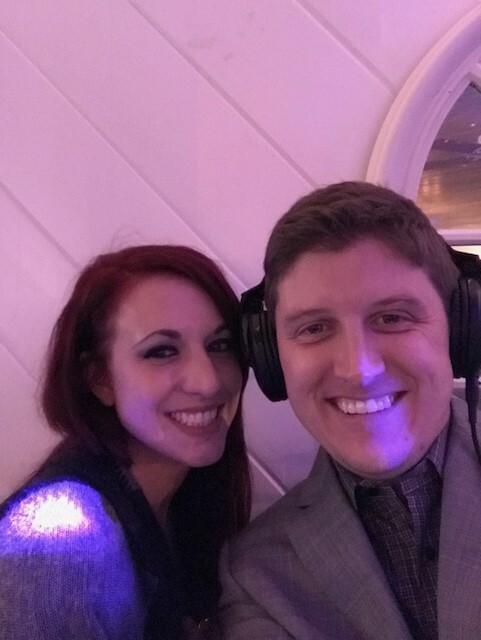 We had a mutual love and passion for the 90s along with some 80s and classic rock jams which were all thrown into the dance party portion of the night as well. 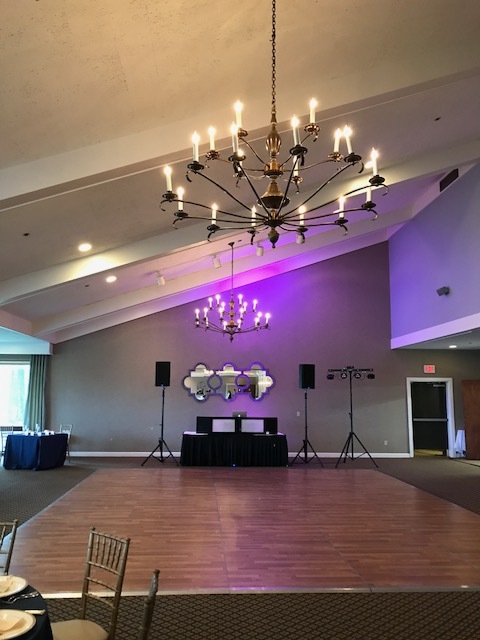 Since I had never DJ’d this particular venue before – we did a quick walk through a couple weeks before the wedding date which always helps me on the day itself. I was able to see where I’d be setting up and the loading/unloading process as well. 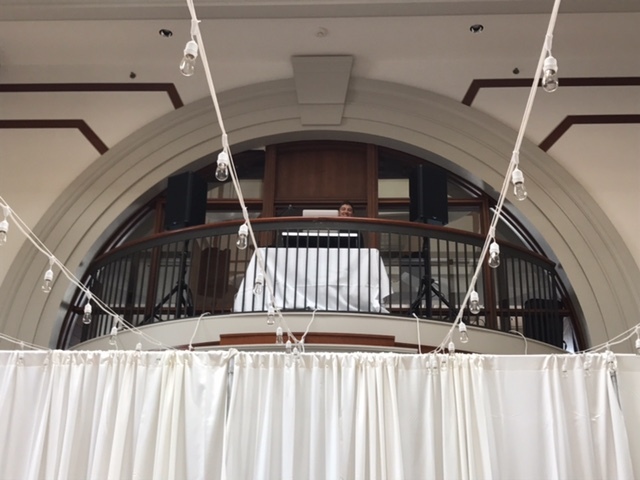 As the calendar hit 8-12-17 – I made my way down to the venue to get set up and sound checked nice and early. 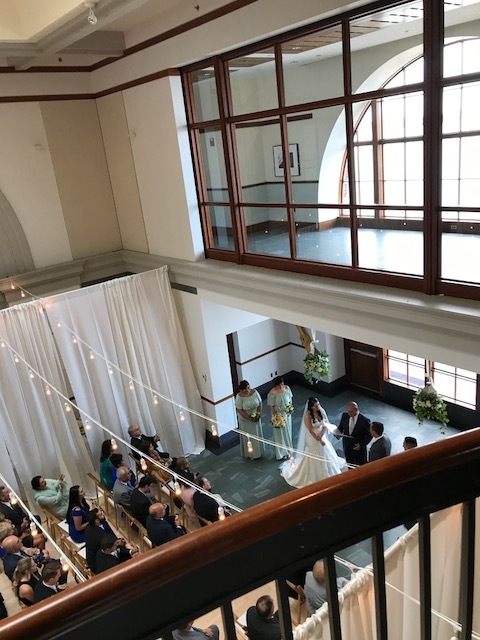 This venue was a bit of a unique layout actually – while all the guests were on the bottom floor area for the ceremony along with reception – I was set up on the second floor overhang balcony overlooking the audience! 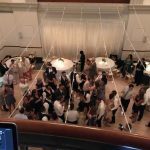 I felt like a DJ in a Miami nightclub haha – and because of the sound being so elevated – the acoustics were incredible and sounded great for all parts of the night. 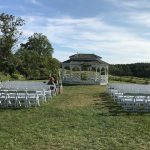 Chris’s uncle took the role of officiating the wedding and he did an incredible job. Pre-ceremony music as guests were shuffling in was a mix of Vitamin String Quartet songs which transitioned to Vitamin String’s version of Aerosmith’s ‘I Don’t Want To Miss a Thing’ – the entire wedding party including Nadia all processed in to this song. 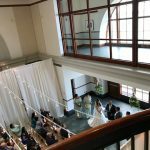 As the ceremony wrapped up they walked out to ‘Hooked on a Feeling’ by Blue Suede (skipping over the weird chanting intro beginning of the track lol). 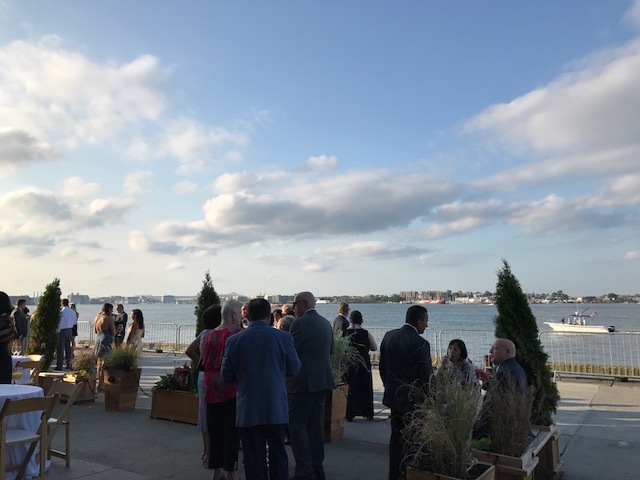 Outside in the back of the venue located right on the water of the Seaport district of Boston was the cocktail hour. 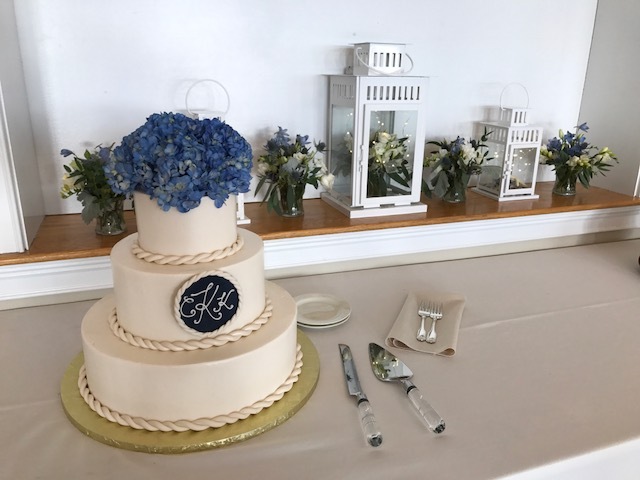 The weather was incredible and being on the water was so nice for the guests. 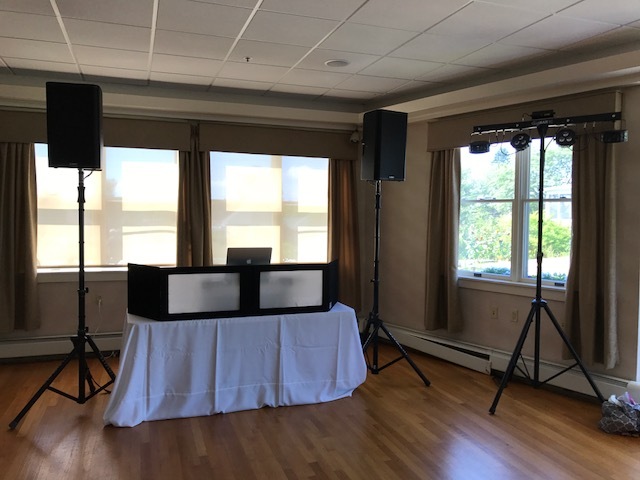 I had a speaker set up for this with a playlist of requests Chris and Nadia wanted with a little bit of country mixed in with some 80s and chill classic rock – and a couple older jazz classics from Sinatra and the Rat Pack as well for good measure. Back inside the venue the staff were flipping the room from ceremony to reception set up and we went into introductions a little while after. 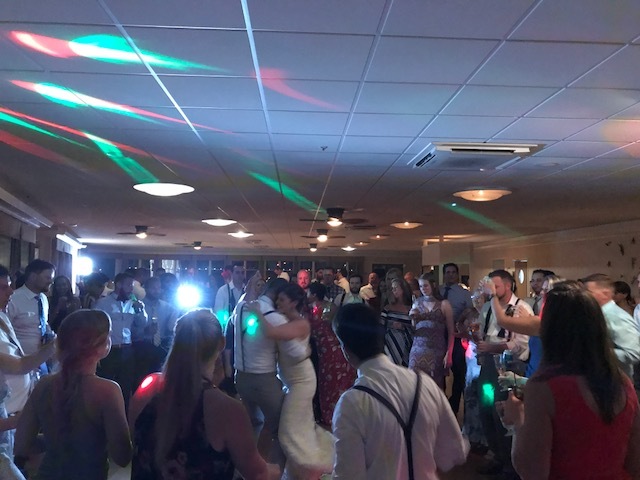 The wedding party were all introduced to “I Gotta Feeling’ by Black Eyed Peas, then Chris and Nadia were introduced to “On Top of the World’ by Imagine Dragons. 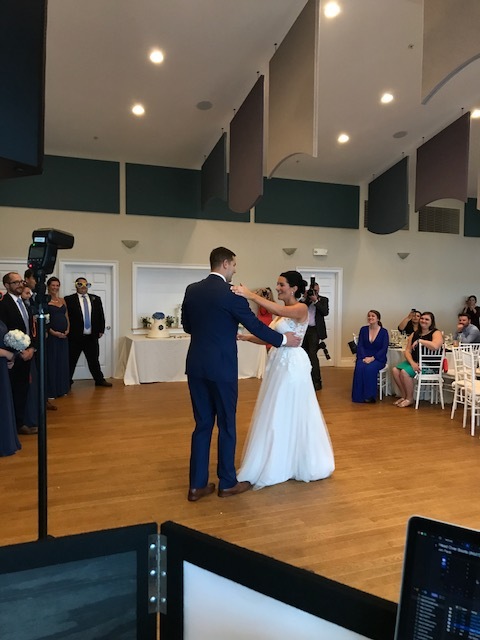 They went directly into their first dance which I had to rip from YouTube as no official recording exists on iTunes yet. ‘Stand By Me’ covered by Imagine Dragons – great version and I didn’t even know it existed so it was nice being exposed to that. We kicked off the dinner part of the night with a few toasts and speeches – while I ran back up to my balcony DJ area to supply the dinner tunes. It was a similar vibe to cocktail hour but also mixing in a group I introduced Chris and Nadia to – Post Modern Jukebox who do all old school jazzy sounding songs but all 90s/and modern top 40 covers. 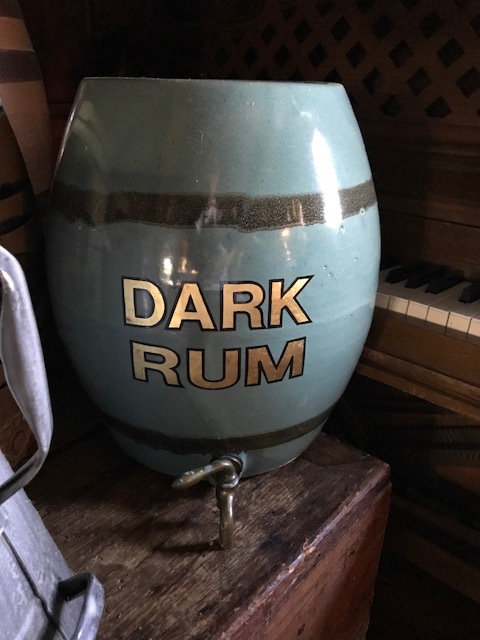 Whenever people catch it – they love it and get a kick out of the music. 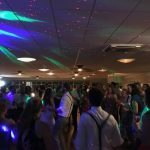 With dinner winding down and people eager to hit the dance floor – we got things rolling with some parent dances. 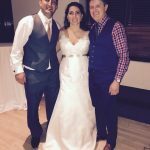 Nadia and her father were up first dancing to ‘A Song for my Daughter’ by Ray Allaire – then Chris and his rockstar grandmother were up next dancing to Rascal Flatts ‘My Wish’. 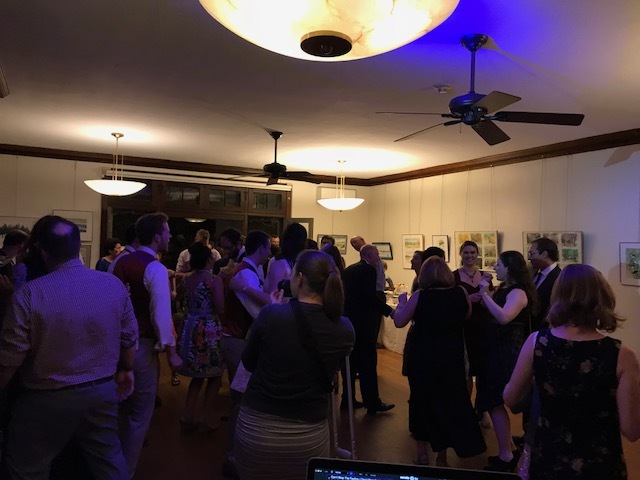 From that I invited everyone to crowd the dance floor and kicked things off with some Stevie Wonder/Jackon 5 right into Bruno, JT, Walk the Moon and then hit the 80s/90s and 70s pretty hard. Being above everyone I had a birds eye view of the entire dance party and it was SUCH a good crowd. 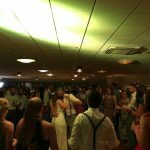 We closed the night out with a massive sing-along requested by the couple of ‘Your Love’ from the Outfield. 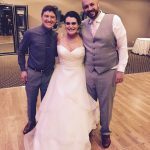 CONGRATS to you guys – thanks a ton for including me in your big day and hopefully we can grab beers again sometime soon at Harpoon or 90s Night! 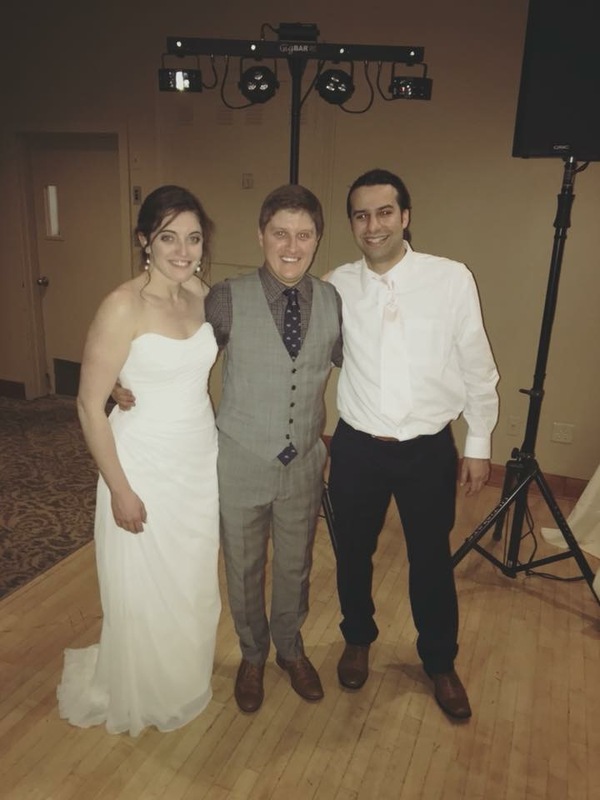 I was connected with this awesome couple from a referral from a wedding I did at the same venue for Sahil and Lindsey back in 2015. 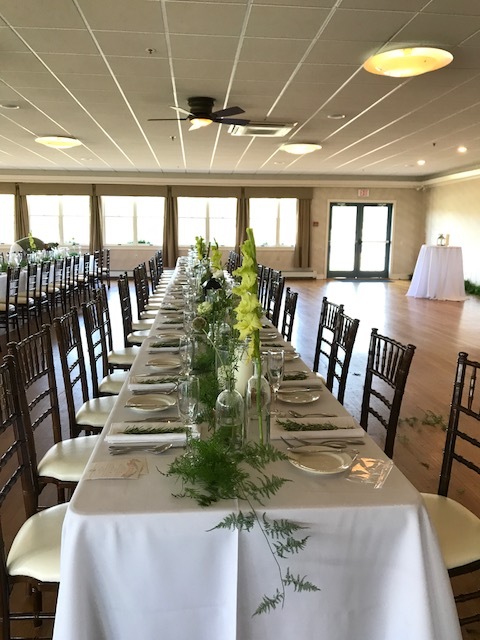 Kristen reached out about a year prior to their wedding date and I was really happy when I saw it was at Five Bridge again – I loved working there – gorgeous layout and very easy to unload/load in as a vendor. Very happy to be back and they ended up having the best weather for the day and night as well. 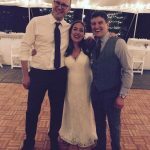 I met up with Kristen and Lucas a couple of times to connect on their vibe and music specifications for the night. Lucas’ background is Argentinian so it was really fun for myself to be exposed to some new music for this gig as he sent me over some playlists of things to download and mix into cocktail/dinner parts of the night along with the dancing. 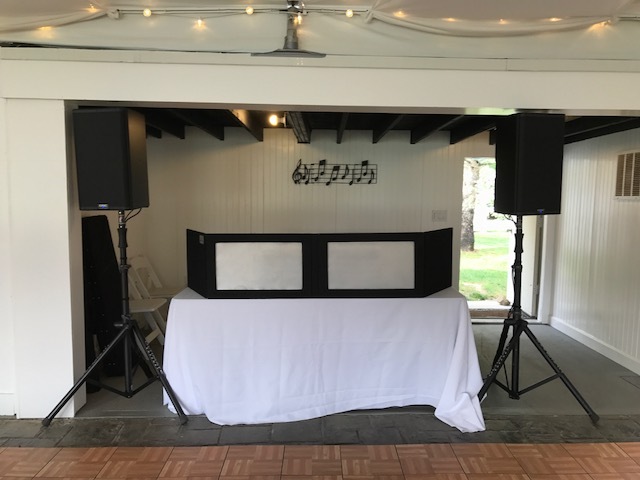 Once the day finally arrived – I set up at the venue as always hours before start time to allow set up, sound check, and set up audio/mic for their ceremony as well which was held right on site. Pre-ceremony music was a shuffled playlist Lucas wanted of some chill jazz tunes from Miles Davis, John Coltrane, etc. and it sounded great on a nice sunny day outside as people took their seats. 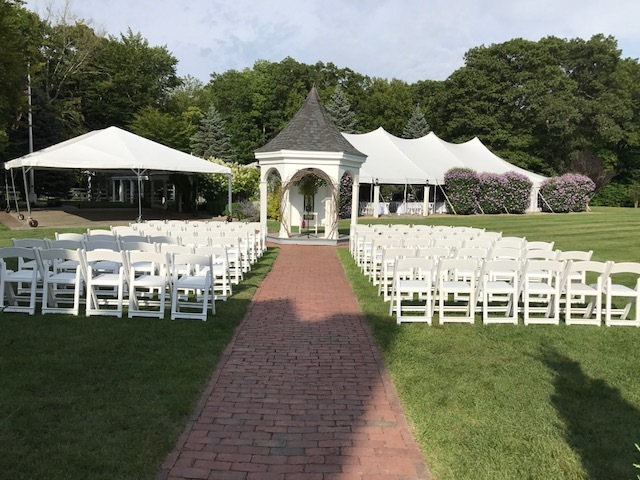 Once the ceremony began the bridal/wedding party including their kids processed to Jim Brickman’s piano version of ‘Air (Handel: Water Music Suite)’ while Kristen was up next walking the aisle to Jim Brickman piano edition of ‘Over the Rainbow’. 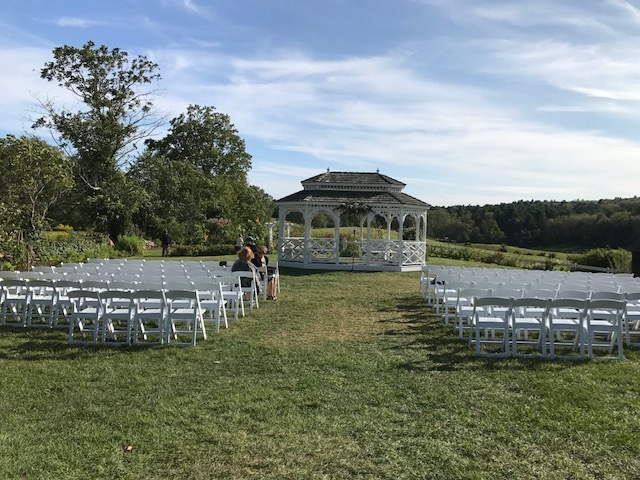 The ceremony itself was very well done and reflected who they are as people – great job from the officiant. As it came to an end the walked off to Sinatra’s ‘The Way You Look Tonight’. Guests then made their way down to the backside of the venue and house for cocktail hour down by the pool area. 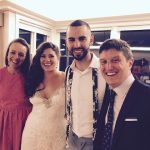 I had a playlist running for this that Kristen and Lucas chose of a mix – some chill jazz music like Sinatra, Etta James mixed up with some Bossanova guitar. Went over very well while people relaxed and got lost in their conversations. The crowd then made their way back up to the front lawn area into the tent where I was setup with my large main set up. 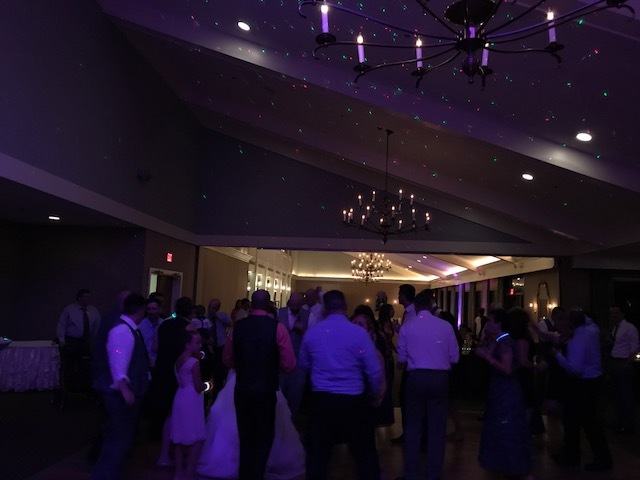 I had some chill music on while they all came in and took their seats and we then introduced Kristen and Lucas to Black Eyed Peas ‘I Gotta Feeling’ which led them into their first dance along with parent dances. 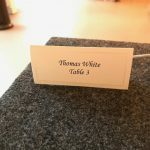 The way this worked as they explained to me months beforehand – which I then explained to the crowd – the first & parent dances are a series of Waltzes which they had sent me a list of. 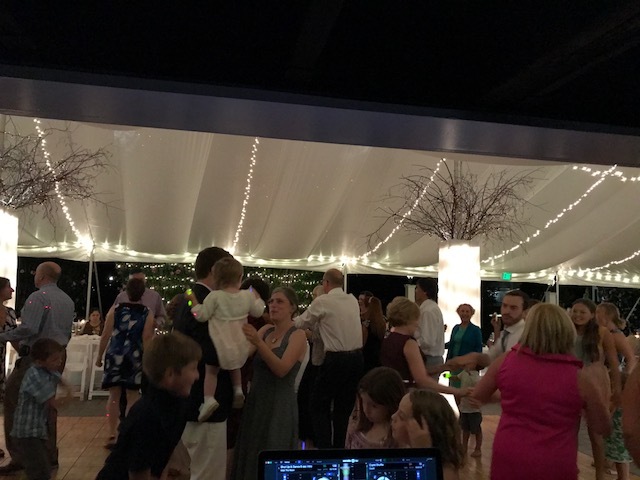 Kristen and Lucas started things off together for a couple of minutes – then their parents joined them all dancing at once – at which point each guy comes up to switch off dancing with Kristen, while each girl comes up to switch off dancing with Lucas. I’ve never seen this tradition before so it was really fun to orchestrate and see it come to life – this went on for about 10-15 mins or so in total. 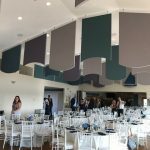 Very unique experience and from that we went into the toasts and dinner music. 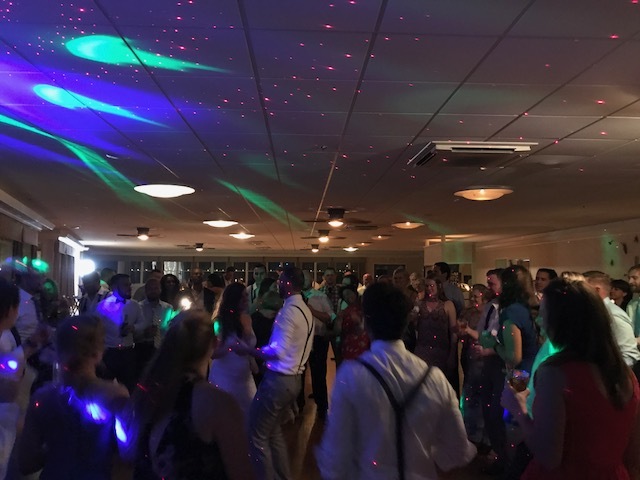 We carried over a bit from the cocktail playlist as they requested and kept that vibe going throughout – along with mixing in specific songs Lucas had given me ahead of time. 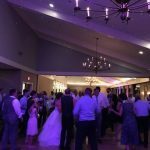 As dinner started winding down – Kristen and Lucas kicked off the dance party by cutting the cake to ‘Sugar’ by Maroon 5. 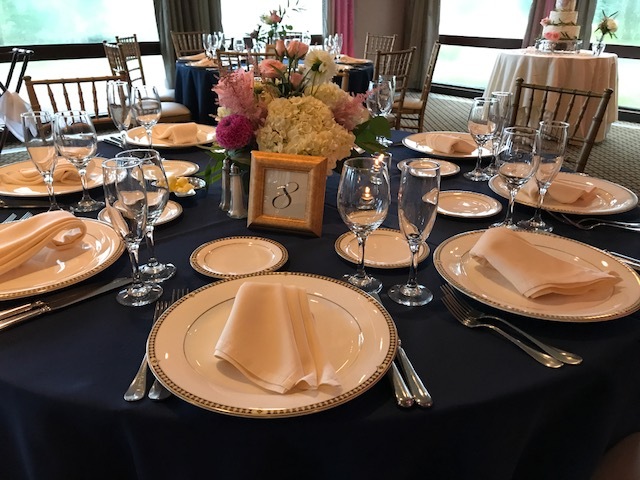 From that – it was an open dance floor for all guests & they didn’t hesitate at all. 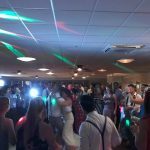 The dance floor was packed with a group of kids who I heard had a few too many Shirley Temples requesting everything from Bruno Mars and JT to the Cha Cha slide. Also on their must playlist were songs like ‘Despacito’ to ‘Smooth Criminal’ and lots of salsa and bachata music. I threw in some personal favorites to accompany that style of music as well from Ozomatli and the Gipsy Kings. 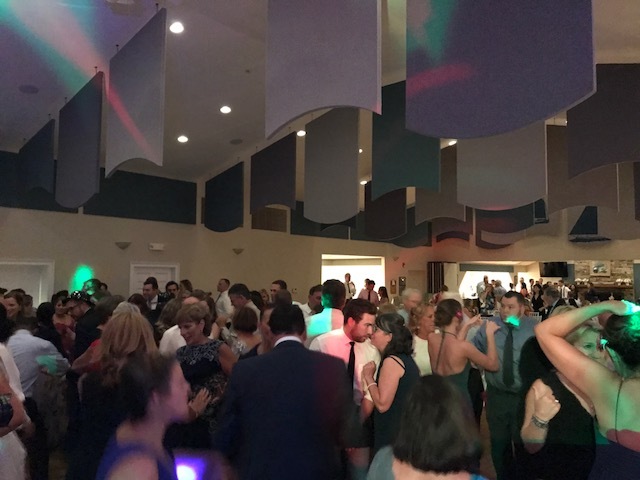 The crowd was a blast to play for and had such a good energy and vibe throughout the entire day and night – not to mention Kristen and Lucas were the nicest people on the planet and beyond easy to work with! Highlight: Ending the entire night and dance party with a song chosen by them: ‘Red Red Wine’ by UB40 – SO good. Thank-you both for putting your trust in me to run the show! 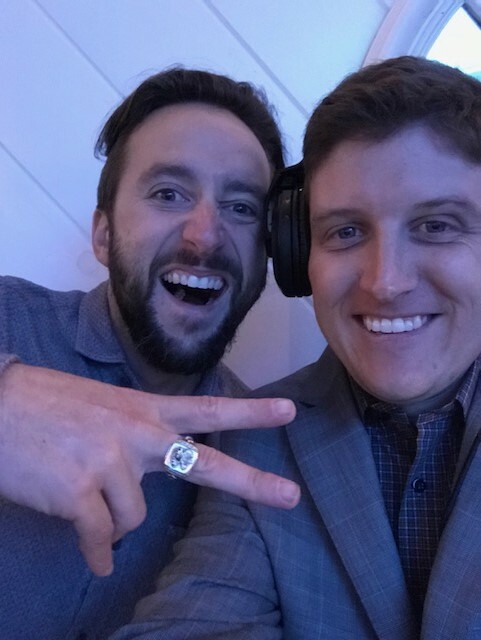 It was awesome to be a part of – CONGRATS!